CH859. This necklace looks like an antique piece but is simply a vintage one manufactured in a largely traditional way. 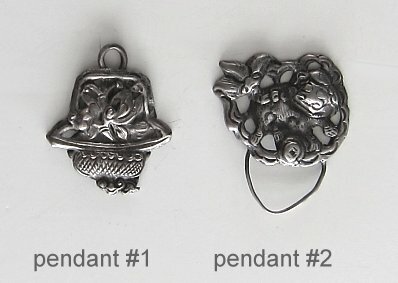 The pendant is a container. The lid screws off (in the opposite direction that is natural in the Americas and in Europe) and a small scoop is attached to the lid. The lid has an enamelled blue lion standing on the top. The pendant has flowers on one side, and good wishes written on the other. Two lotus blossums hang as pendants. The central pendant has been added on more recently, perhaps one had been lost over the years. It is a Christian token and can easily be taken off and something else substiuted there - a blue bead might be a nice addition instead. The necklace chain is 20 inches long and has a hook closure on it. 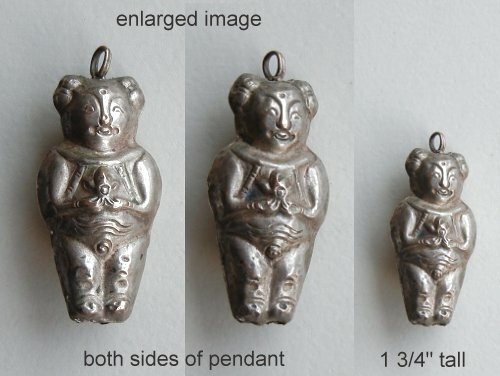 The pendant from top of lion to bottom of central pendant is 1 1/2 inches tall. The necklace sits very nicely and is very attractive. $185.US. CH875. 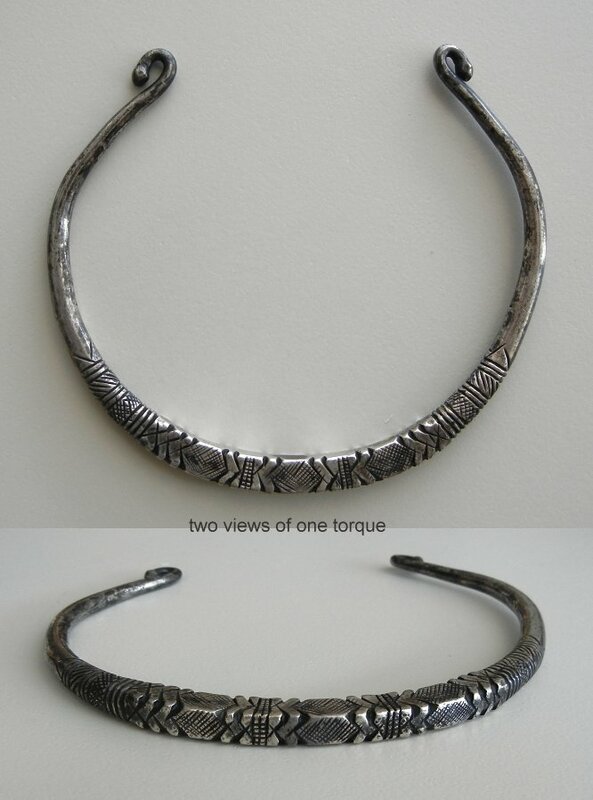 You can see this style of silver bracelet on page 264 of "A World of Bracelets". They are described as "Golden Triangle, Burma. These cuffs have braided wires and applied elements decorated with repousse." These are very attractive with their complex designs and graceful shape. This is a good sized bracelet, too large for my 6 inch wrist. 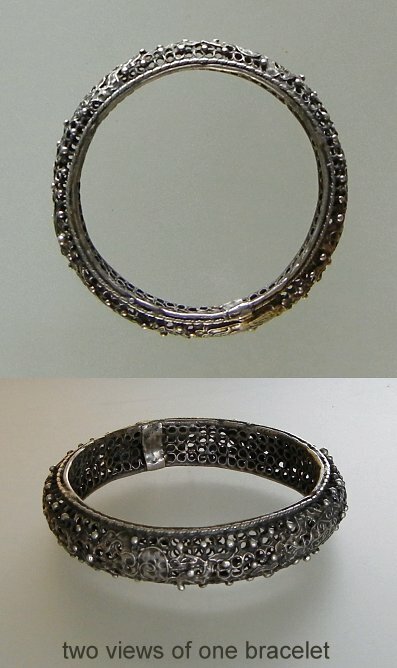 The oval inside of the bracelet measures 2 5/8 inches by 2 inches across. The opening is 1 1/4 inches wide but can be carefully squeezed to be a little narrower and tighter. The band of the bracelet is 1 1/8 inches wide. $220.US. CH876. 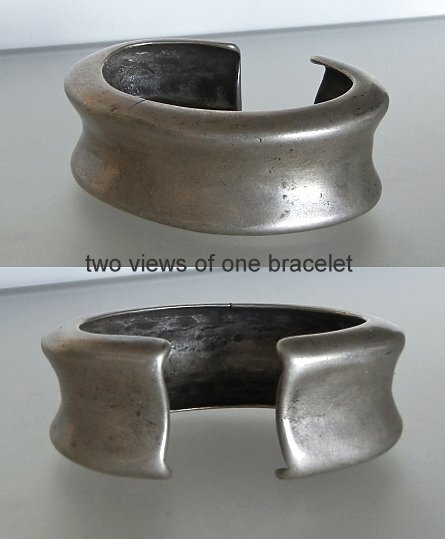 You can see this style of silver bracelet on page 264 of "A World of Bracelets". They are described as "Golden Triangle, Burma. These cuffs have braided wires and applied elements decorated with repousse." These are very attractive with their complex designs and graceful shape. This bracelet is similar to the one above but not exactly the same. It measures 2 1/2 inches by 2 1/8 inches on the inside with a 1 inch wide opening. The band of the bracelet is 1 1/4 inches wide. $220.US. CH880. 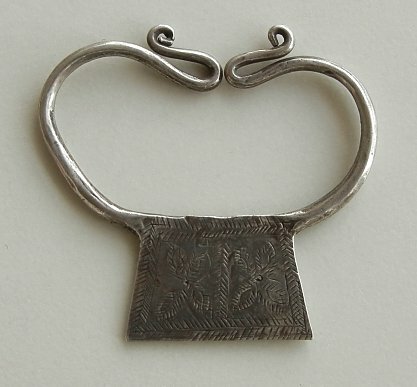 This is a very heavy silver Timor bracelet in its traditional shape. This is an antique that has been well worn softening the finish over years. This is best for a flat wrist, not a round one. The inside measures 1 3/4 inch by 2 3/4 inch across on the inside. The opening is 1 inch wide so the wearer's hand has to slip through that. This is quite a sculptural item. 155 grams $465.US. CH884. Most of what I sell is wearable but every once in a while I add some pieces just because I find them attractive as well as great cultural references. 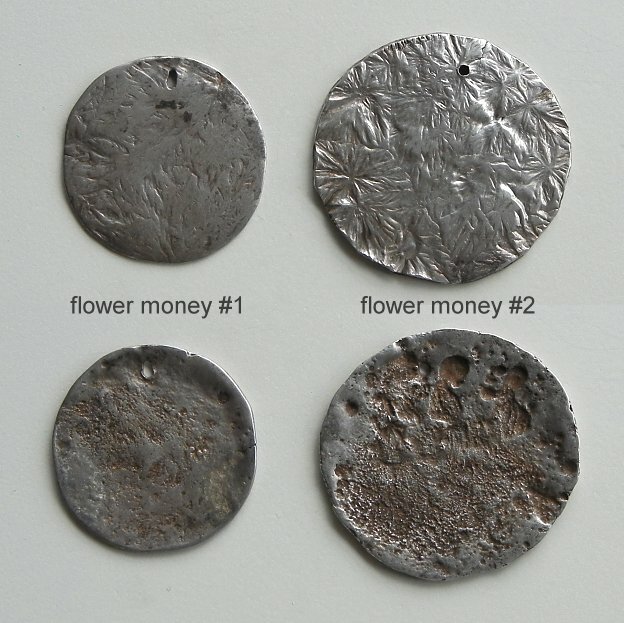 Here is some antique money from the Kingdom of Thailand. These are known as Pod Duang (bullet money). The group of bahts weighs 53.3 grams. The ones in the preview pic (if you see it about 1 1/2 inches tall) are close to life size. When you click to see the entire photo it is enlarged so that you can see more of the details. The largest (1 baht) is just over 1/2 inch across. The largest coin is 1 baht (Rama IV) Mongkut (1851-1861). 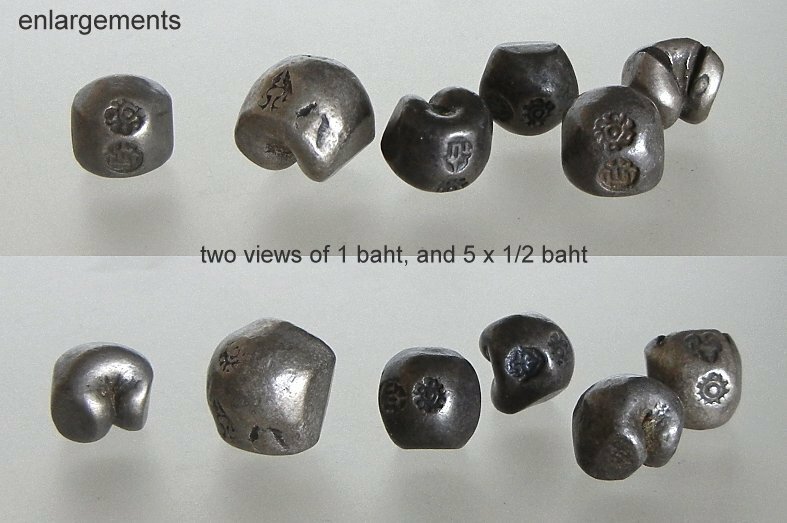 The other five coins are each 1/2 baht (Rama III) Prasat (1824-1851). They each have a chakra, a sun sign stamped into them representing the god Vishnu. The other stamps indicate the ruler at the time. I am selling these as a group for $295.US. CH885. 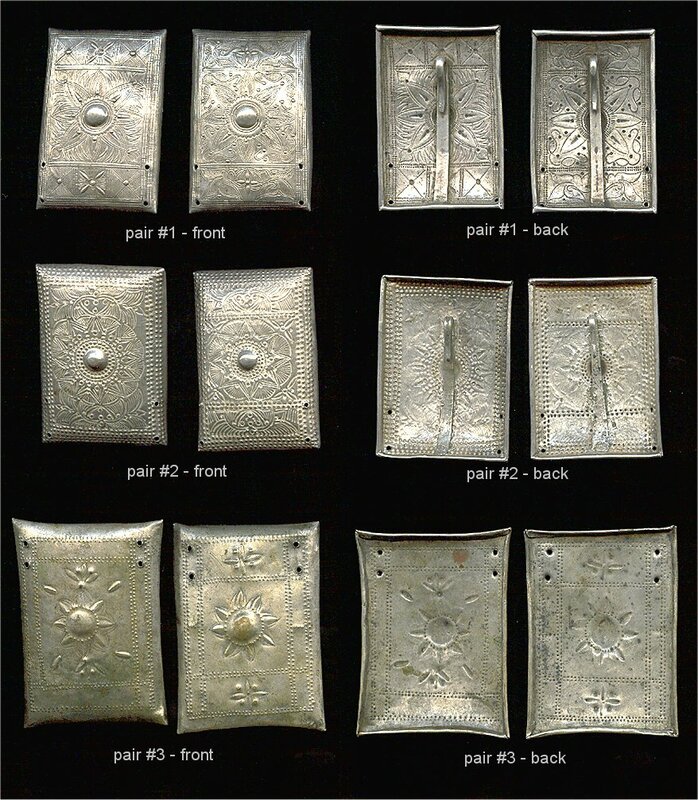 I find this style of silver ingot coin very fascinating as they are made by pouring molten silver into a mold. The bubbly part came into contact with the mold, and the flatter part which looks like waves are washing across it is the top. where the silver was poured into the sand mold. The coin has been counter stamped while still hot - which might indicate the emperor at the time, the value, or be a personal mark. This is a Chinese Empire Sycee Tael in a drum shape from the 19th century, measuring 1 1/8 inch across at the longest. $345.US. CH887. This is a very gorgeous antique tool kit from China with a very eye catching butterfly at the top. The wings have been enamelled with blue and decorated with some very small beads. 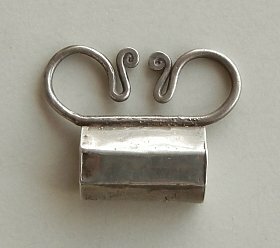 There is a hook as an attachment which could be used to turn it into a pendant - very carefully. The butterfly is a little over 1 3/4 inches across and the entire piece is 6 1/2 inches tall. It has used a number of types of workmanship to create a very attractive piece. $285.US. CH902. 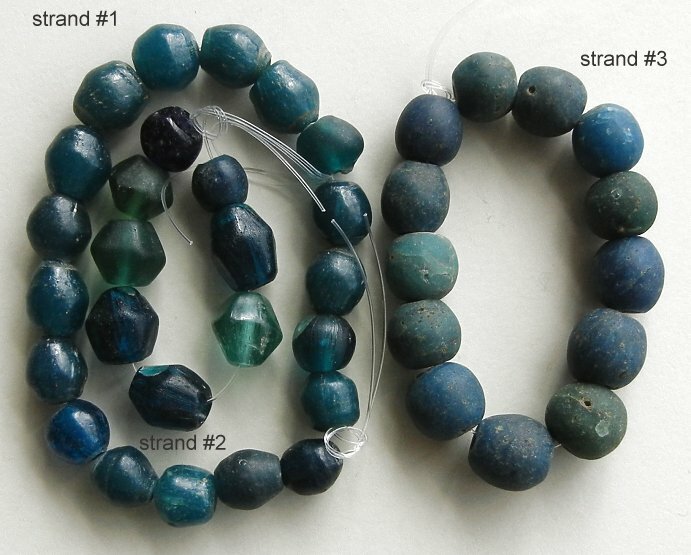 These are described as Jatim beads coming out of Indonesia. They come from a collection so were originally bought a number of years ago. 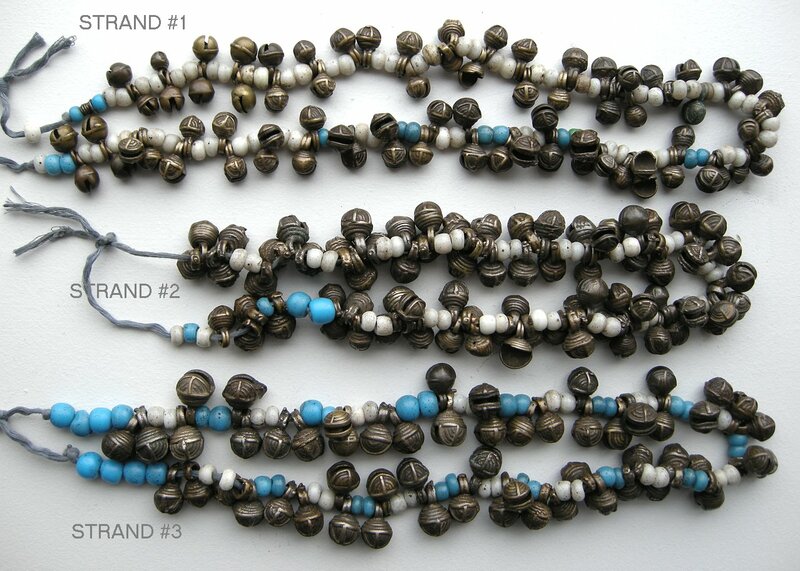 There is a little more than 20 inches of beads with four patterned beads. The one in the central of the preview image is just under 7/8 inch in diameter. The largest bead is slightly over an inch in diameter. There are two damaged beads - I will add an illustration of them when I have the chance. 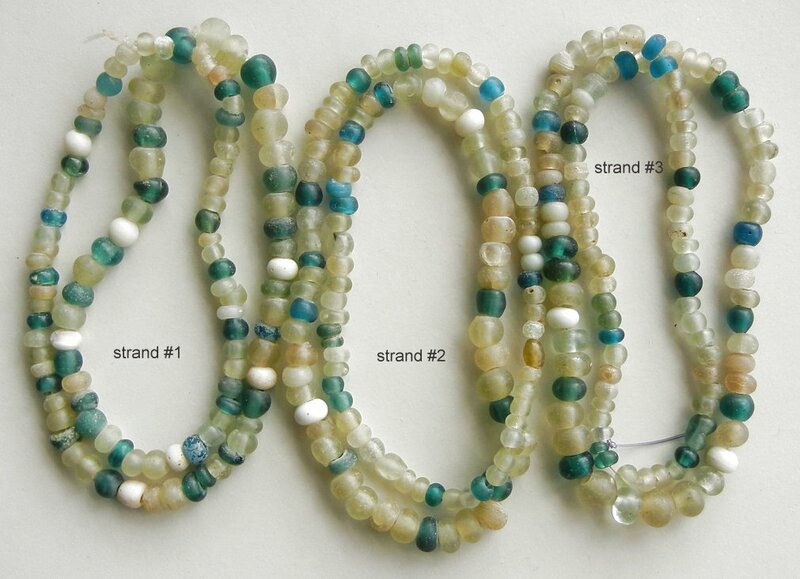 The beads are sold as the entire strand for $600.US. CH903. Strand #1 is 22 inches. $450.US. Strand #2 is 22 inches. $400.US. CH907. 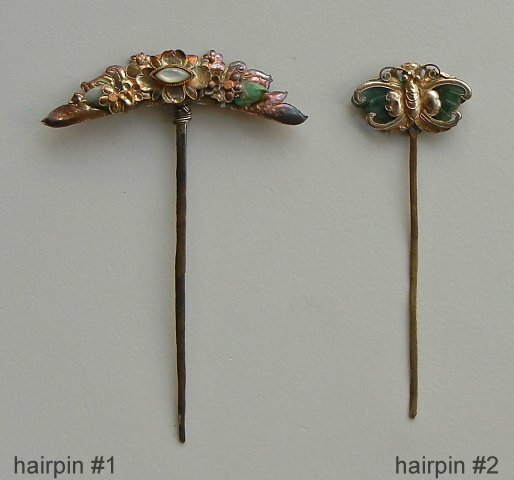 There are some lovely antique enamelled hairpins illustrated here. #1 is a single piece 5 inches tall. The butterfly decoration is slightly over 1 1/4 inches tall. $160.US. 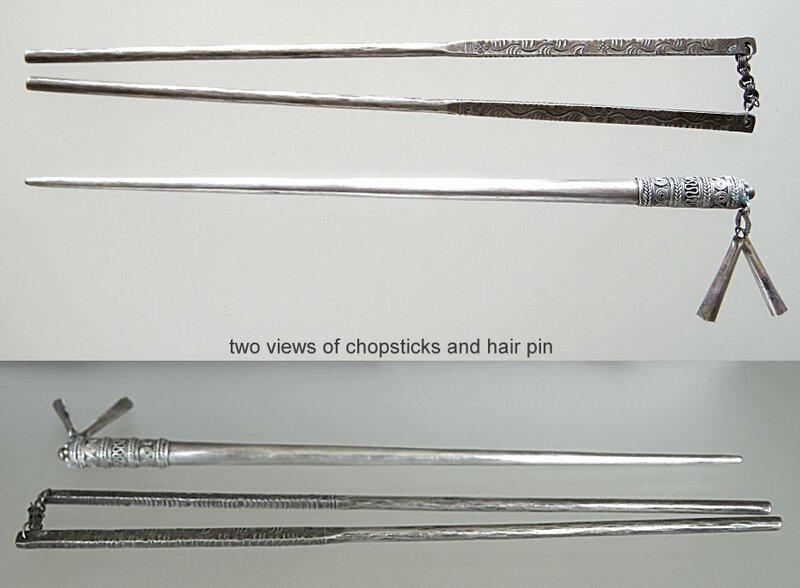 #2 is a pair of hairpins, very similar to each other though one has a single pin and the other has a pair. The one with two pins is 5 1/2 inches tall. 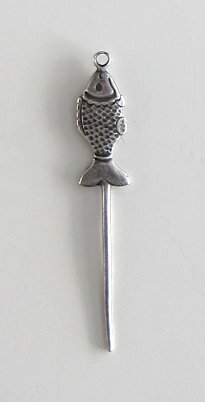 The pins also have tiny spoon shapes at the ends - I wonder if they were a cleaning tool as well? $240.US. CH909. This 13 inch long silver tool kit from China has some strong design features like the carved silver rectangles in the hanging chain. The piece has a hook at the top used probably, to hook over a belt. Somehow this has a contemporary quality to it as well. $250.US. CH910. This is a rather magnificent antique silver bat adorned tool kit. The entire piece is 17 inches long. The bat at the top is 1 7/8 inches wide, just the same as the one below. 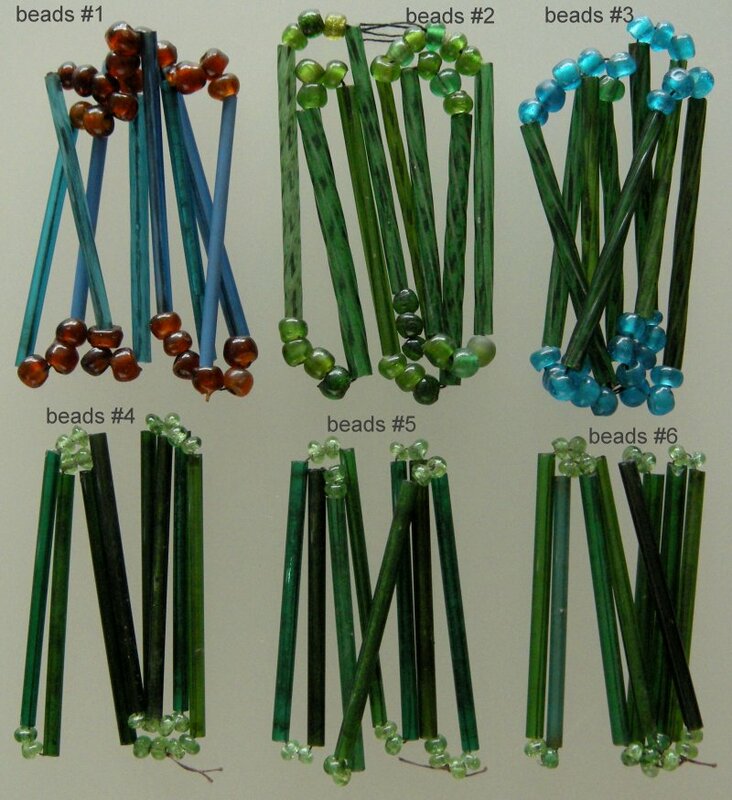 Bright green glass Peking glass beads pick up a little bit of light. Any time I try one on, fastening it at my waist, I wish that such romantic items were a part of our culture as well. $585.US. CH912. 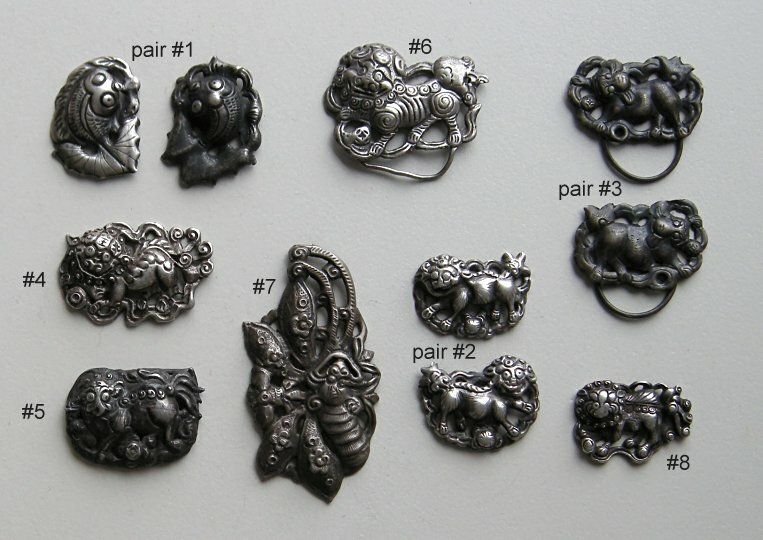 These are beautiful hammered antique silver pieces of lion like dragons. They have holes pierced in them so that they can stitched onto clothing or onto hats. Nice old ones like these (and many other items) are becoming scarce now so I was happy to find these. Pair #1 are 1 3/4 inches across. $85.US. Pair #2 are 1 9/16 inches across. $95.US. CH915. #1 - $20.US. #2 - $10.US. #3 - $14.US. #4 - #13.US. #5 - $12.US. #6 - $19.US. #7 - $21.US. #8 - $15.US. #9 - $13.US. #10 - $14.US. #11 - $14.US. #12 - $10.US. #13 - $12.US. #14 - $15.US. #15 - $10.US. #16 - $15.US. #17 - $18.US. #18. - $10.US. #19 - $13.US. #20 - $14.US. #21 - $10.US. CH916. 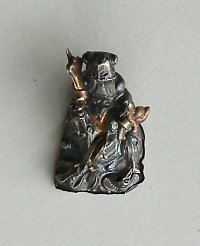 Here is a more complex Chinese silver piece. $30.US. CH917. This is an absolutely wonderful ring from China with beautiful art work on it. The carving is gorgeous. 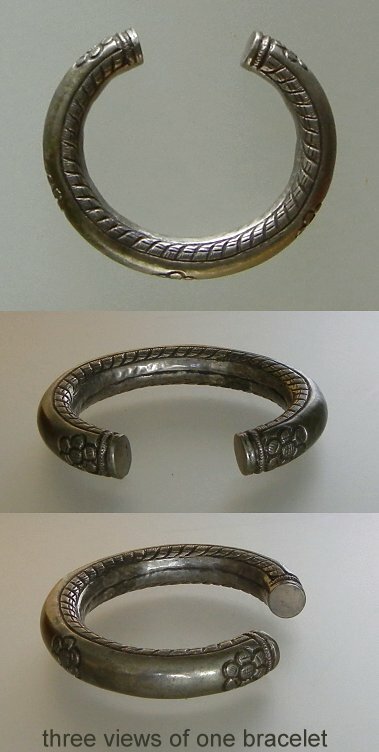 It is one decorated piece of silver that has been curved into a ring shape. The size can be changed but only gently - perhaps a half size larger or smaller. Very carefully though. Right now it is a size 9. You can see the designs on the enlarged photos. $320.US. CH919. 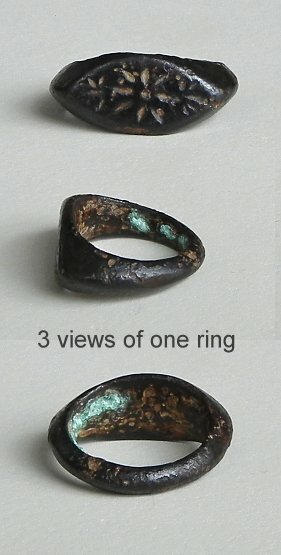 Here is an unusual and very collectible Pyu bronze ring from Burma. It is heavily patinated and a few hundred years old. The top image is that of an eye decorated with lines that make me think of a star. You can see gold rings of the same shape on page 166 of "A World of Rings". The eye shape is 13/16 inch across. The ring fits a size 6. $300.US. CH922. This is an antique key from Tibet, made of bronze with a nice dark patination to it. The key is 4 3/4 inches long and just under 1/4 inch at the thickets so quite heavy. It does have a stringing hole. $150.US. CH927. 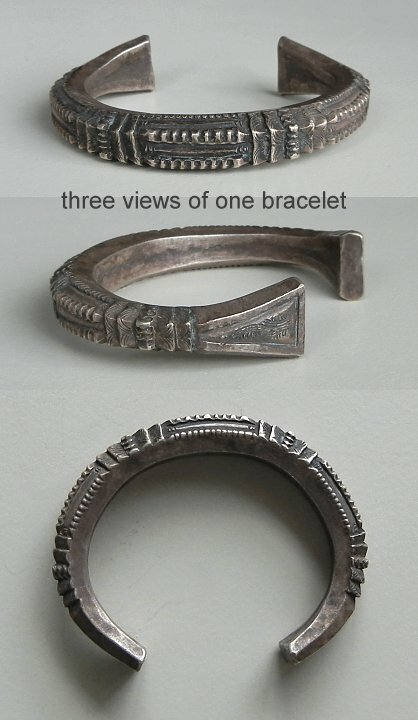 This is a beautiful solid silver bracelet worn by the Wa and the Lawa from the area of the Golden Triangle. The bracelet weighs 122 grams which is double that of many other types of bracelets from the area. The decorative elements are cut deeply and dramatically into the silver. The bracelet measures 2 1/4 inches by 1 3/4 inches across on the inside with an opening 1 3/8 inches wide. $385.US. CH928. This is quite a large sized bracelet measuring 2 1/4 inches by 2 3/4 inches across on the inside with a 1 inch wide opening. The bracelet has a bit of flexibility to it so opens a little wider if needed when slipping it on. The bracelet is slightly over 5/8 inch tall. It has a wire work background with decorative elements soldered onto it, decorated with enamelling. The ends have round decorations with dark amber coloured stones in the middle - Minority work from China. $400.US. CH929. 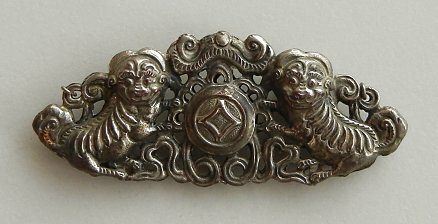 This is a very appropriate pair of antique silver Chinese bracelets during the year of the dragon as they are decorated with images of dragons. The graceful and imaginative decorations are hammered and pierced beautifully. The bracelets are hinged and close firmly with lovely chains hanging down with small discs stamped with "100%". The tallest part of the bracelets is slightly over 7/8 inch while the shortest is 5/8 inch. The inside of the bracelets measure 2 inches by 2 1/4 inches. $500.US. CH931. You can see a bracelet similar to this one on page 267 of "A World of Bracelets". It came from the Hmong of Thailand. Rather than wrapping as many do, this bracelet meets at the back. This is solid silver that is thickest at the ridge around the middle. The bracelet is 2 3/4 inches in diameter. 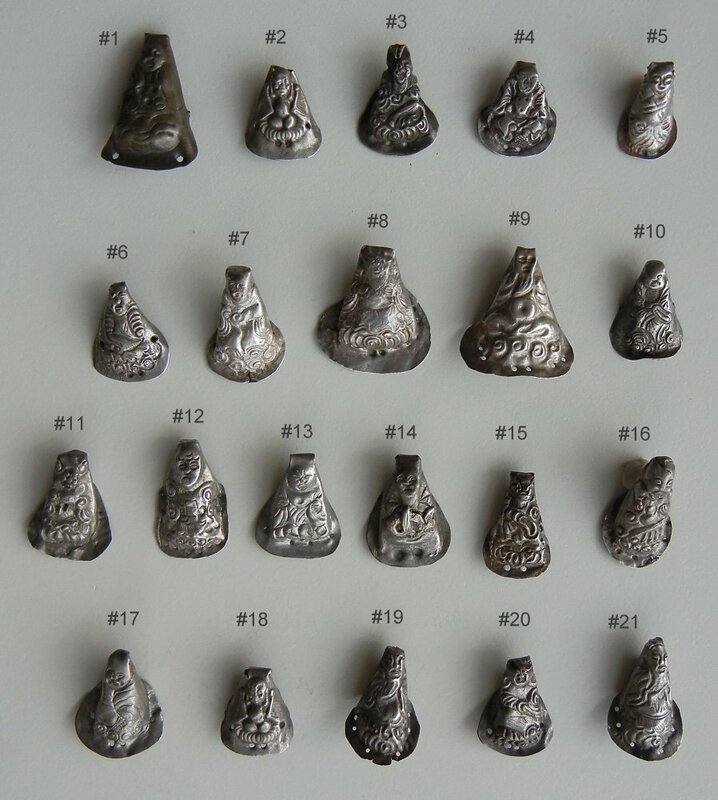 The widest part of the silver is 3/4 inch tall. $230.US. CH932. 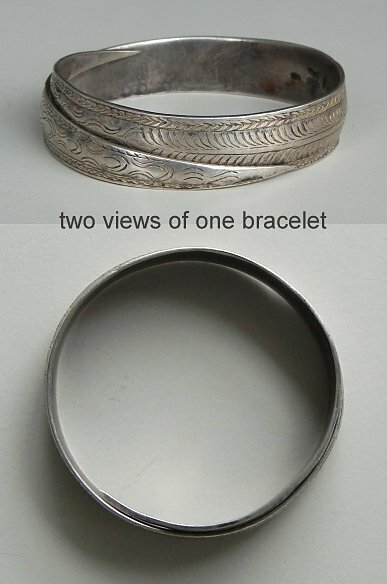 There is a bracelet similar to this on page 267 of "A World of Bracelets". It is wrapped tightly like this. These bracelets were made by the Hmong people of Thailand. These are always beautifully etched with expressive designs. This bracelet measures 2 1/2 inches in diameter. The tallest part is 3/4 inch tall. $230.US. CH933. 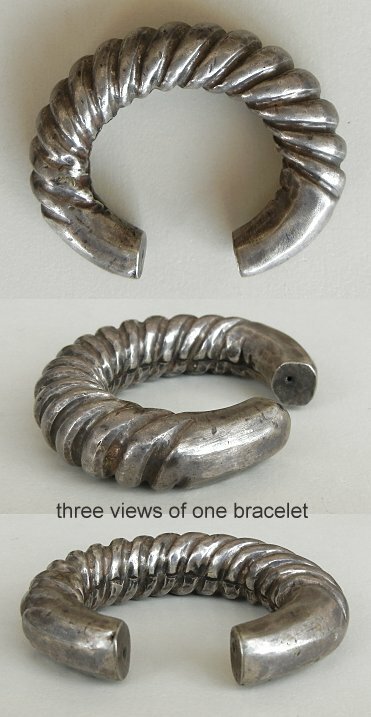 There is a bracelet similar to this on page 267 of "A World of Bracelets". These are made and worn by the Hmong people of Thailand and often worn in groups. This piece has very expressive floral designs etched into it. The bracelet is 3 inches in diameter, and the tallest part is 3/4 inch high. $245.US. CH937. 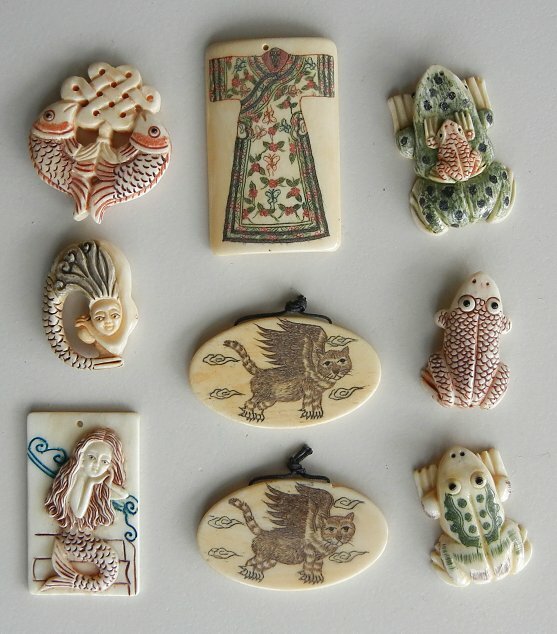 The mahjong tile here is 7/8 by 1 1/4 inches in size and portrays a dragon - a worthy symbol now, in the year of the dragon. The ring is a size 6. $58.US. CH940. This is a very delicate and graceful antique silver tool kit from China. The entire piece is 8 inches long and the triangle is 1 5/8 inches wide. The triangle is engraved beautifully on both sides with the same images. $200.US. CH978. 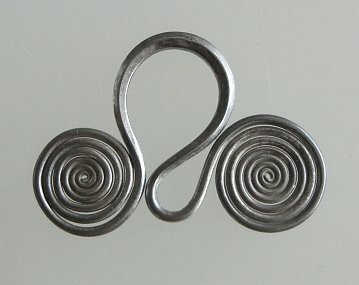 This spiralled piece is one half of a Miao silver clasp. It can easily be used as a pendant. The piece measures a little over 2 3/4 inches across and weighs 32.2 grams. $128.US. CH979. There are two pairs of antique silver earrings here from the Golden Triangle area. You can see by the fine work that they are old originals rather than new copies, now popular as well. 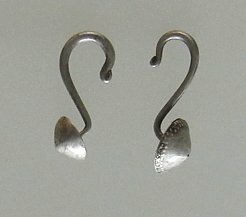 You can see a pair very similar to #1 (a little over 1 1/2 inches tall) on page 227 of "A World of Earrings". These are typically worn in Laos. $155.US. A pair similar to #2 is illustrated on page 232. These are worn by the Yao and Hmong. According to the book: "The minorities of Vietnam and China also wear earrings with triangular elements. Yao goldsmiths, who also work for other tribes, are highly esteemed." $155.US. CH981. This is a very attractive antique Chinese silver needle case shown closed and partly open. It needs strings to go through the double holes to keep it shut - beads are often hung from the as well, but for me, they make excellent pendants for a necklace. This one has been beautifully hammered with complex images. 3 1/8 inches tall. $165.US. CH990. 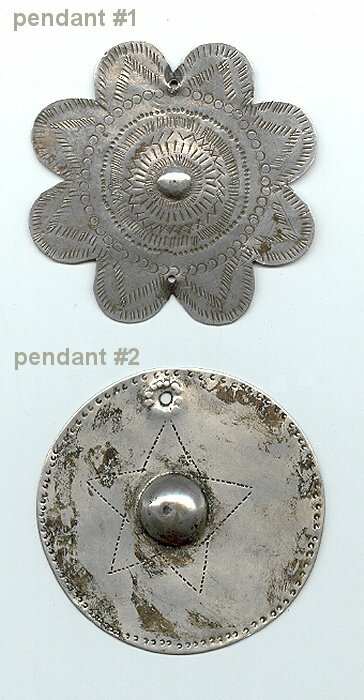 This vintage silver pendant (2 1/4 inches across) is from Thailand. It is nicely pierced with two holes so easily strung. $75.US. CH993. This gorgeous antique (200+ yrs old) pale aqua coloured glass piece is from SouthEast Asia. It is 1 inch in diameter and 3/8 inch wide at the edge, a little wider in the center. It was bought in Cambodia but I am not sure where it originate or whether it is an earplug or a labret. Most likely for the ear though. $185.US. CH994. 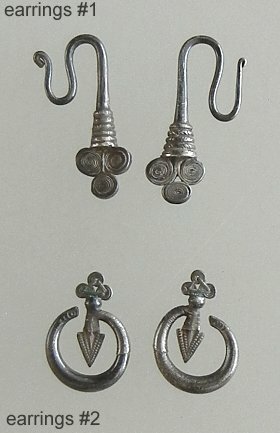 This style of earrings is shown on page 227 of "A World of Earrings". They come from the Golden Triangle (Hmong and Yao). 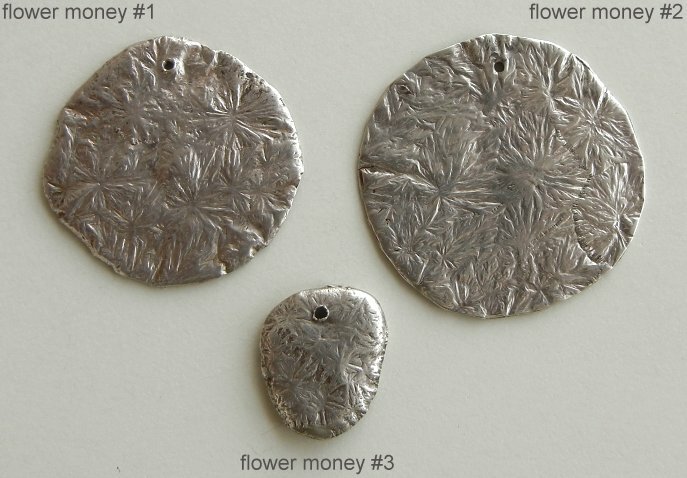 These are made of silver, are traditional and antique and beautifully made. There are many modern pieces for sale but these are (you can see by the workmanship) original ones. $145.US. CH1000. 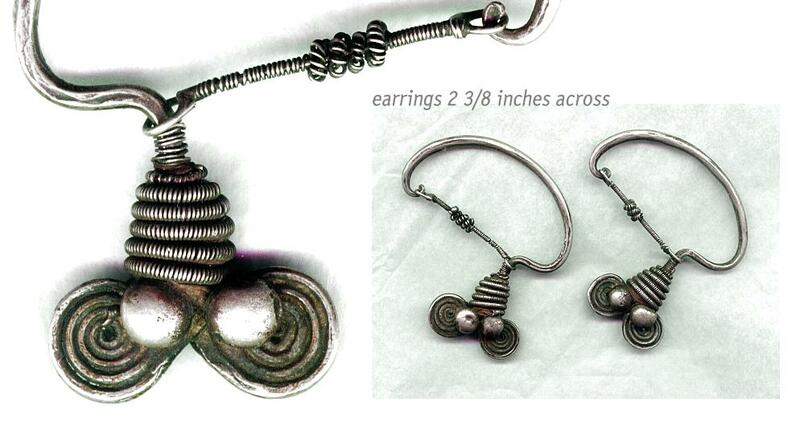 These antique silver earrings came from the area known as the "Golden Triangle". I am unsure of specifically where though. The earrings are similar but slightly mis-matched as one has a domed piece soldered in the front. They are 1 3/16 inches tall and you need larger than European size ear holes. They have been sitting out so are tarnished and need a good cleaning. $110.US. CH1001. You can see earrings along this line on page 283 of "A World of Earrings". 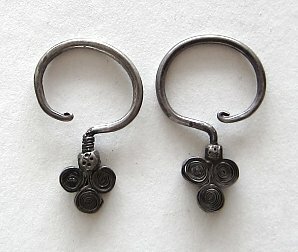 This is one antique silver "split" earring from Indonesia which is quite old and worn. It can be used as a pendant instead. The earring is slightly over 1 inch tall. $115.US. CH1010. 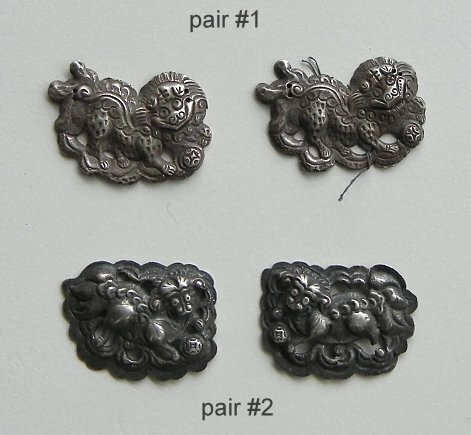 There are two Chinese silver hammered pieces here which could work as pendants. They had been used sewn onto hats or clothing in the past but can always have a new use. #1 is a flower basket 1 1/2 inches tall. $55.US. 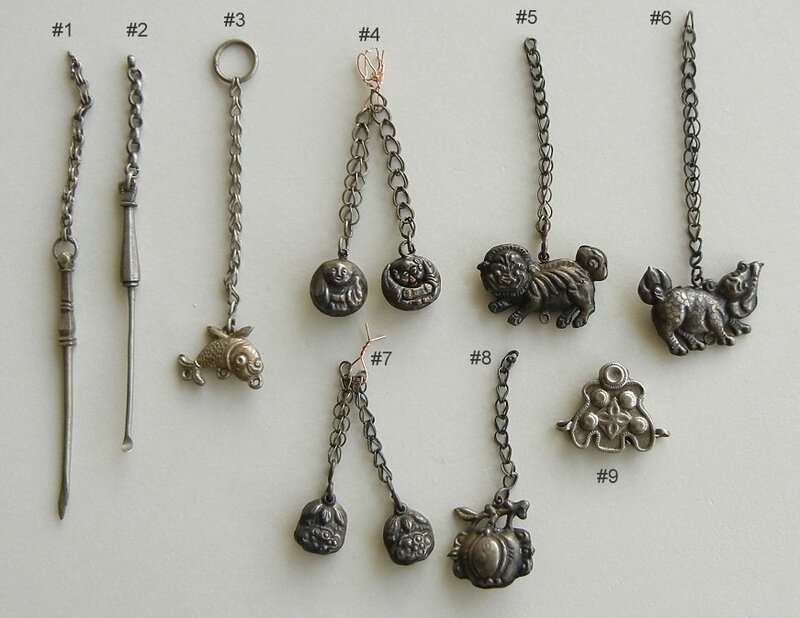 #2 is probably one half of a clasp illustrated with an animal. It is 1 1/2 inches tall. $60.US. CH1013. Here is an unusual antique silver enamelled needle case which is actually still containing old needles. 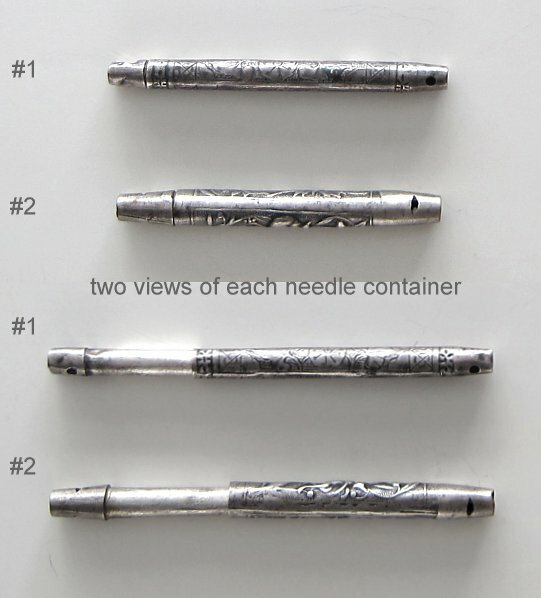 This needle case is interesting though, as it is made from two - top half from one case and bottom half from another. They match up very nicely though so were most likely made from the same manufacturer. This does make a very attractive pendant/dangle with the beautiful work on it and the very nice chain and hook to suspend it. The case itself is 2 1/4 inches tall, and slightly under 1/4 inch thick. The chain with hook is 6 1/2 inches long. $330.US. CH1014. 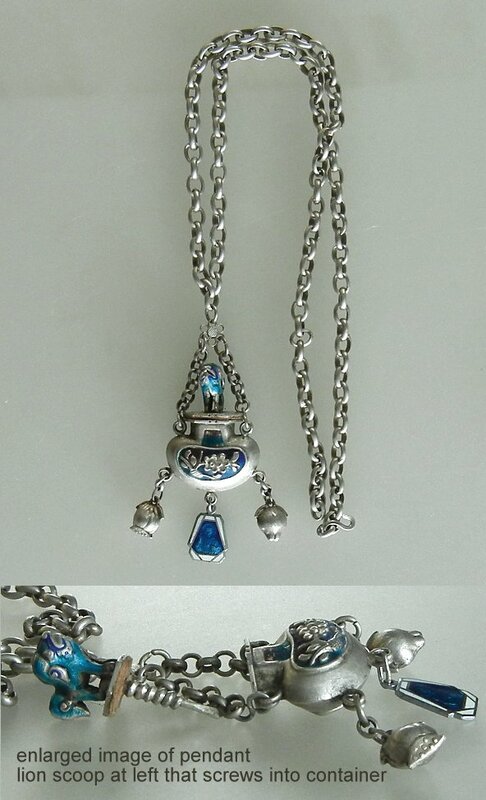 This silver dangle from China is 6 3/4 inches long with lots of dangles going off in different directions. It is ready to hang where you choose. (15.4 grams) $110.US. CH1015. This is one of the few items that I have had from Mongolia. 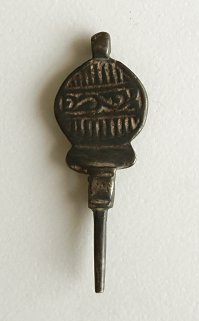 I wonder if it was used as a pin with some attachment at the hook, or if it was used as a pendant. The piece is cast silver. I do not know much more than that. $125.US. CH1022. 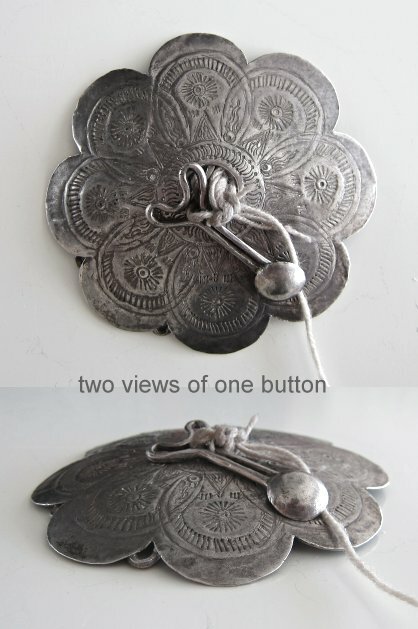 I have always really liked these antique silver Burmese buttons where the center part hooks into the center of the flower from behind to shut it. It is just tied on right now so that it isn't lost. The button is just over 3 1/8 inches across with an attractive and complex pattern. $195.US. CH1029. 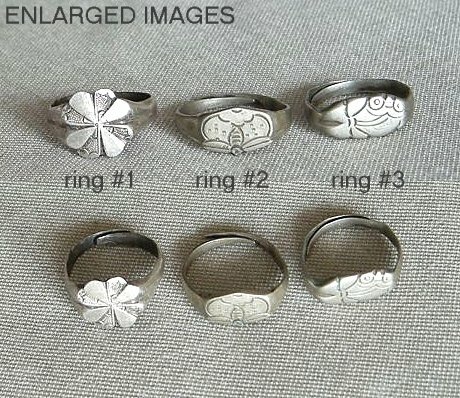 These rings were commissioned by one of my dealers in Bangkok and made there as well. The ring is made of an antique Burmese opium weights added to a silver ring. This ring is a size 7.5. It measures 1 5/8 inch from top to bottom. $150.US. CH1030. 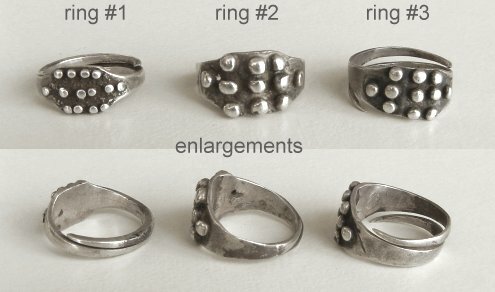 These rings were commissioned by one of my dealers in Bangkok and made there as well. The ring is made of an antique Burmese opium weights added to a silver ring. This ring is a size 8. It measures 1 14/16 inches from top to bottom. $150.US. CH1031. These rings were commissioned by one of my dealers in Bangkok and made there as well. 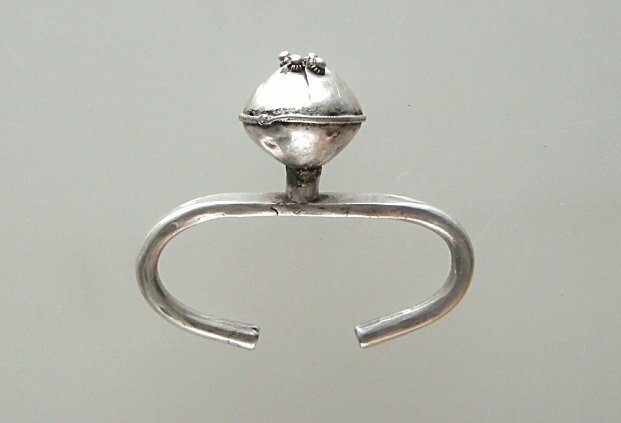 The ring is made of an antique Burmese opium weights added to a silver ring. This ring is a size 7. It measures a little over 1 3/8 inches from top to bottom. $150.US. CH1032. These rings were commissioned by one of my dealers in Bangkok and made there as well. The ring is made of an antique Burmese opium weights added to a silver ring. This ring is a size 8.5. It measures 1 5/8 inches from top to bottom. $150.US. CH1033. This is a nice hollow light-weight silver dragon bracelet from China though it was brought out of Tibet. It is 2 1/8 inches by 2 inches across on the inside - the part that the wrist fits within. The opening is 1 inch wide at the narrowest. $250.US. CH1035. This is a very delicate looking, delicately made antique silver bracelet from China. It has a diameter of 3/8 inch and the inside measures 2 5/16 inches across. It needs to be slipped over the hand so do measure other bracelets that you have to make sure it will work. $325.US. CH1038. 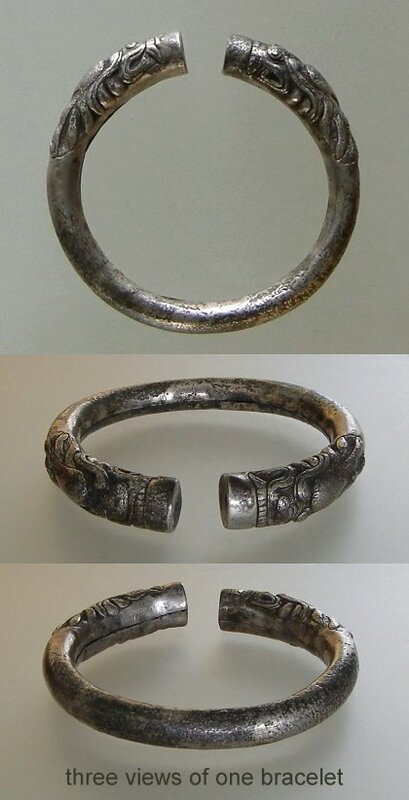 Here is a solid silver bracelet from China - a smaller version of the same type as CH1034 just a little above (116 grams). You can see similar styles on page 250 of "A World of Bracelets". This style crosses over into the Golden Triangle as well. These lovely genuinely old pieces are very hard to find now. 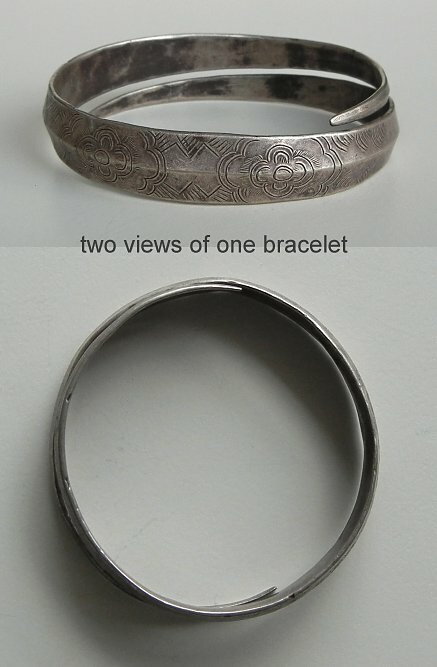 The inside of the bracelet measures 2 1/4 inch in diameter. $400.US. CH1039. The preview picture opens to a reduced size photo of this rather wonderful head-dress from women of the Bai people living in Dali Yunnan, China. You can google their name to see some of the traditional clothing. These pieces were draped over the head so that a piece with fringes fell on each side. This is a rather wonderful piece with enamelled discs on it. They have the same design on each side. The pieces from the hanging cord down measure 22 inches long. The discs are just under 5/8 inch across. This is a very unusual piece. $285.US. CH1041. Here is a beautifully carved and etched silver torque (less than sterling but a great colour so it looks like sterling) from the area of the "Golden Triangle". The piece itself measures 12 3/8 inches from end to end. The circle that it makes including open space is 15 inches around. The space is slightly under 3 inches wide. My neck is 14 1/4 inches around and it fits me nicely sitting at the base of my neck. I put it on from the side and then turn it to face the correct direction. If one was nervous about it falling off, a ribbon can be tied at the back. It was quite oxidized and I just gave it a light cleaning. $155.US. CH1042. I can never duplicate the real colour of red in a photograph. This necklace has 18 strands of antique tubular glass beads in a range of colours of red to them. There are a few dark almost opaque ones in there too to add some contrast. The strands are an average of 23 inches long and the entire necklace 27-28 inches around. It is closed by a small vaseline bead and a loop. This came from the Burma/Nagaland area. $375.US. CH1043. 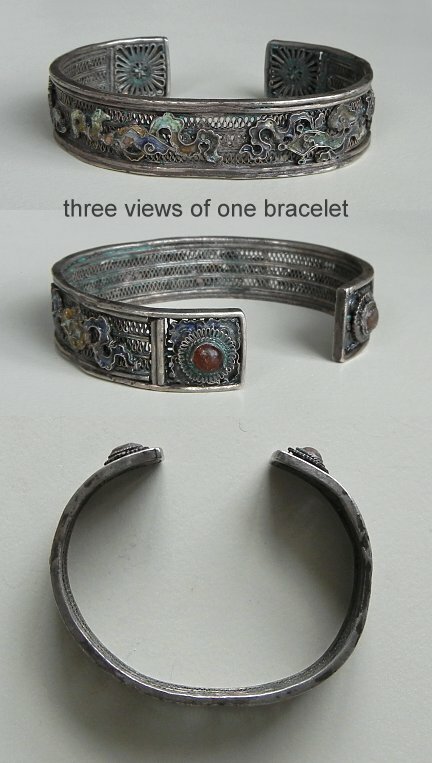 This antique silver Miao bracelet from China represents caterpillars according to "A World of Bracelets". It has a great pattern to it with raised dome, really evoking the movement and shape of the caterpillar. The bracelet is 1 3/4 inches by 2 1/4 inches on the inside with an inch wide opening. $245.US. CH1049. This is a 46 inch strand of Irian Jaya trade beads. $100.US. CH1057. #1 has two strands of beads in it, each 24 inches long. They are sold together for $75.US. Strand #2 is a 20 inch long strand of orange white hearts. $25.US. Strand #3 has two strands, each 23 inches long. They are sold together for $50.US. CH1058. This necklace came out of Thailand. This is only 19 inches around so might have been made for a girl as it is quite small. These are very attractive and delicate antique beads. $30.US. CH1066. 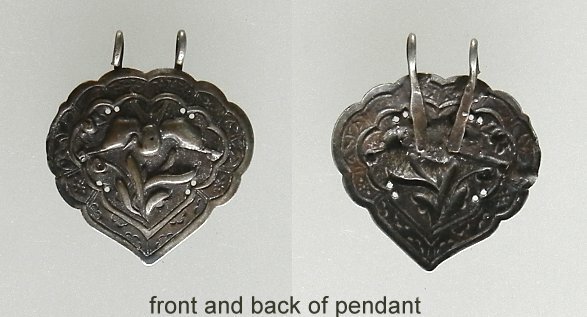 This pendant has an image of two Qilin in opposition. The Qilin are mythological creatures representing wisdom and cosmic harmony. They have a dragon's head, a lion's tail and mane and scaly body representing a deer. They can symbolize longetivity as well. 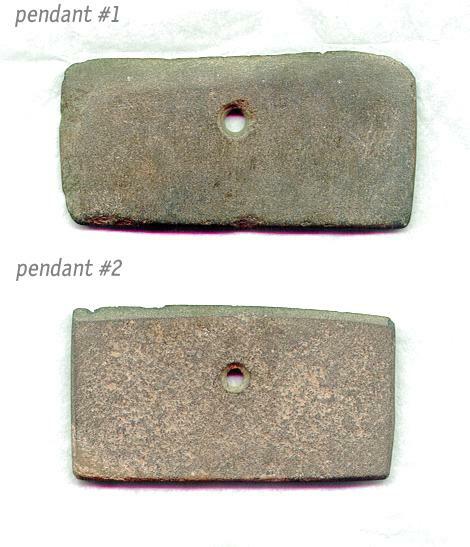 This antique pendant is the same on each side and 3 3/4 inches wide. There are holes for stringing... $165.US. CH1067. This is a deceptive photo but in reality the chains are both the same length with slightly differently patterned hooks on top to attach the pendant to a neckpiece. The pendant is 2 3/16 inches wide and the entire piece is 6 3/4 inches long. $115.US. CH1069. This is one of the most beautiful chatelaines from China that I have had. I love the intricate decorations on the pieces as well as the fat little fish strung on as well. When stretched out the length is 20 inches with pendants at each end and 9 inches of chain in the center. I haven't found a grooming kit quite like this in my reference books. This is silver and an antique with a beautiful colour to it. A little bit of buffing would make it gleam beautifully. $395.US. CH1071. This is the first 3-dimensional spirit lock that I have had. The arms are 2 inches wide, and the box is 1 1/4 inches wide. The box is a little over 3/8 inches high. It is a very interesting looking and unusual vintage piece. $250.US. CH1072. This is a lovely wide armed antique Hmong spirit lock (bought in Laos). It is one of my favourite styles. The arms on this one spread 3 3/8 inches wide. The widest part of the pendant is 1 7/8 inches across. You can see how the single piece of silver was hammered into shape by looking at the back - a huge amount of work with hammering, then anealing the silver, then hammering again, and anealing it to soften it... 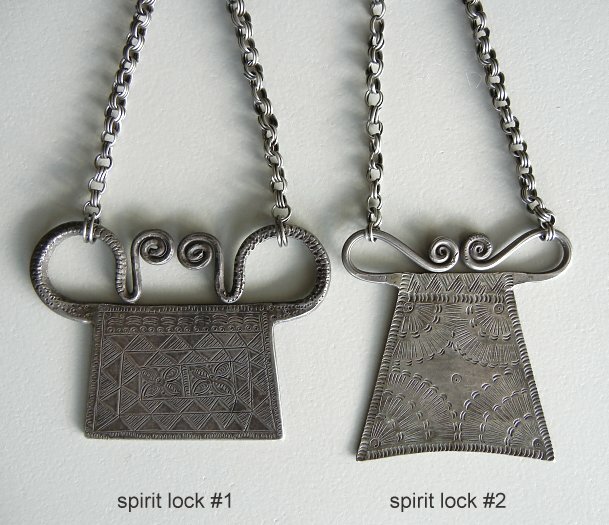 The spirit lock is worn to protect the body from harm. $345.US. CH1073. This is an intricately hammered antique Hmong spirit lock (bought in Laos) with lovely wide arms to it. 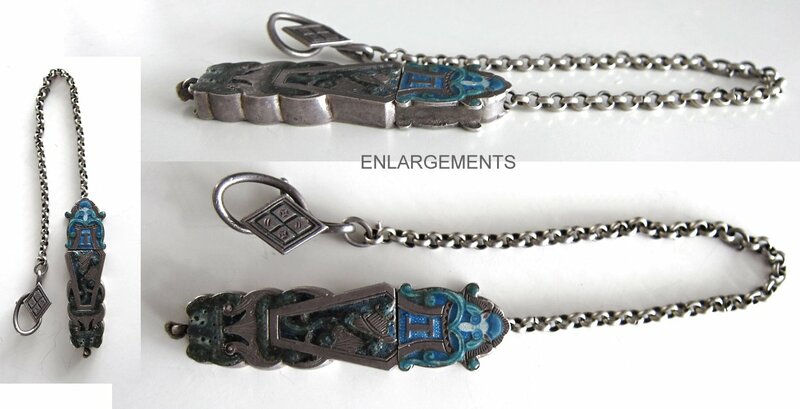 The arms are 3 3/8 inches wide and the pendant part is 1 5/8 inches at the widest. 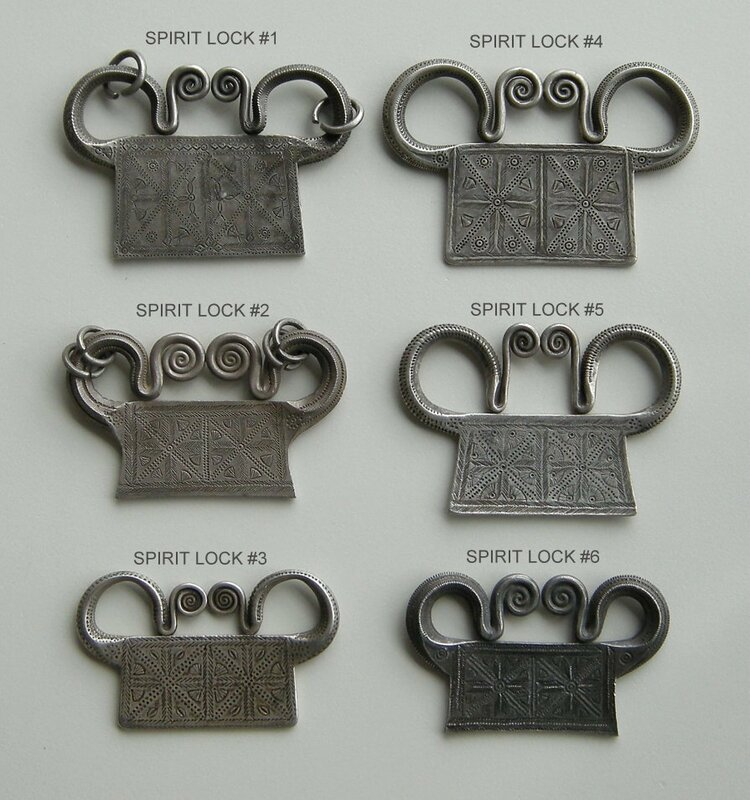 Spirit locks are worn to keep harm away. $300.US. CH1081. 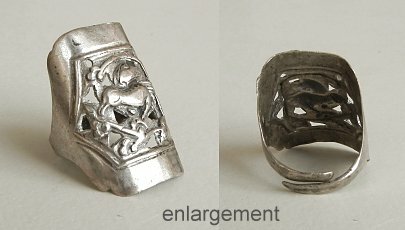 This antique wrapped silver Chinese ring has been squared off a little when someone tried to change the size. It is a 10-10.5. $120.US. CH1082. 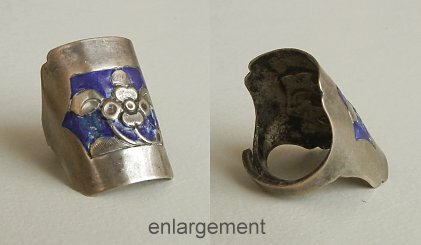 This antique wrapped silver Chinese ring has been hammered with a flower design and then enamelled with a dark blue. Size 9.5. $75.US. CH1083. 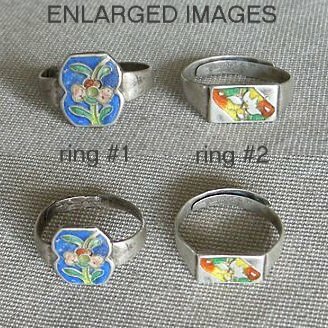 Here is a sweet little enamelled flower ring. The ring band has a cut in it but is still strong and firm as the silver is antique and not very flexible. Size 7.5. $35.US. CH1096. These are all pendant style beads. 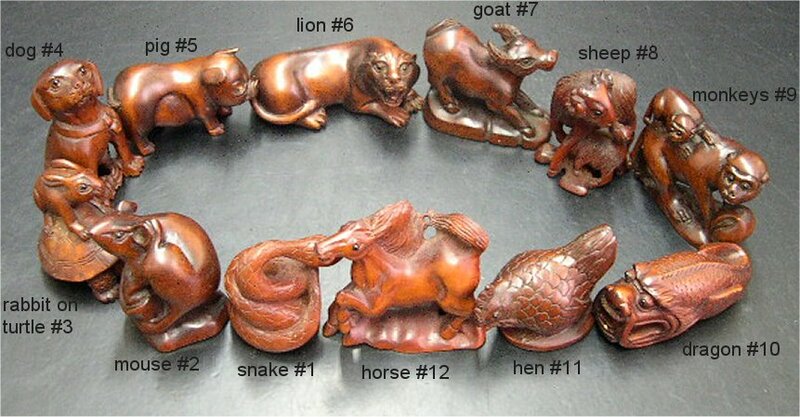 There is also a chicken that isn't in the photograph so there are ten pieces in all, carved from tagua nuts. The frog in the preview picture is 1 3/8 inches tall with the stringing hole going from top to bottom. $50.US for the group. CH1099. 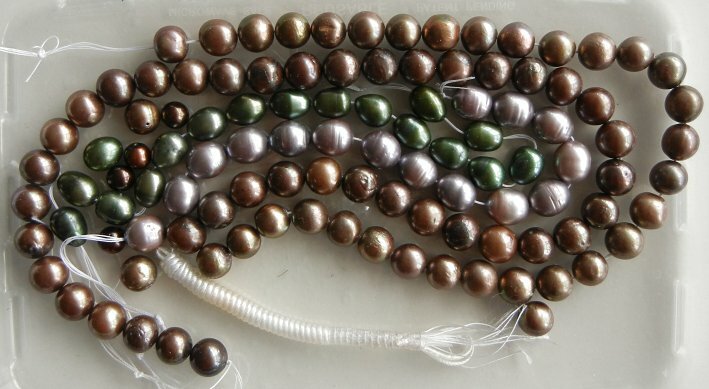 These dyed pearls are left over from a project a number of years ago. There are more than 36 inches of beads included. $35.US. CH2004. 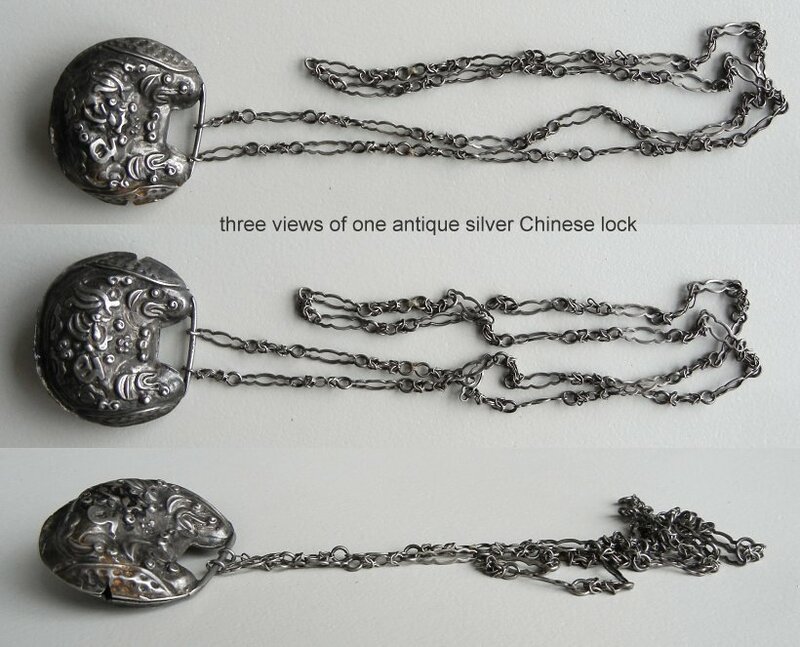 This is a gorgeous antique spirit lock from China. It is a nice plump one with intricate images hammered into each side. The piece has been bumped around a bit so is not as perfect as when it was first made, but it has a great look to it. One one side is a little "V" shaped cut that you can see in the photo. The fine hand made chain is 26 inches long. $220.US. CH2007. Here is an interesting necklace made with some interesting beads. There are two softly facet carnelians (the one at the front is 1 5/8 inches long and 5/8-3/4 inch in diameter) and a lovely hand made silver closure. 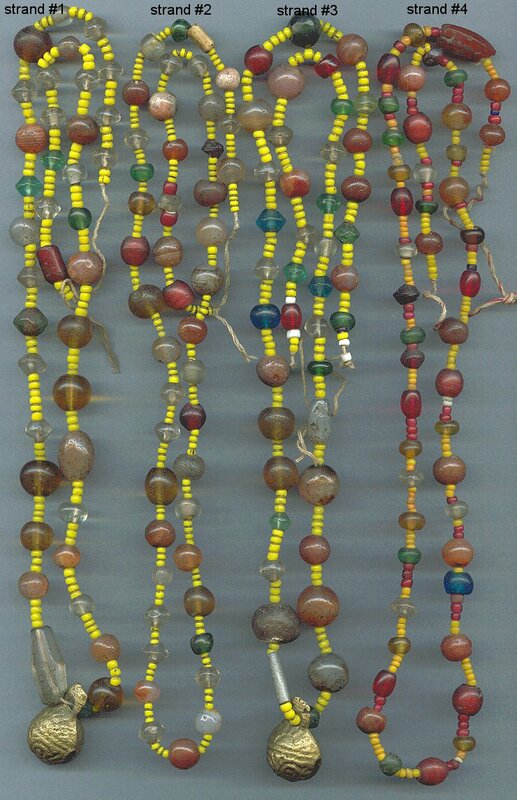 The other beads are Mizoram beads - probably once strung in the type of necklace illustrated on page 243 of "A World of Necklaces". I am not guaranteeing exactly what the materials are - whether resin or amber/burmite - they came from India where they were worn by the Mizo women. 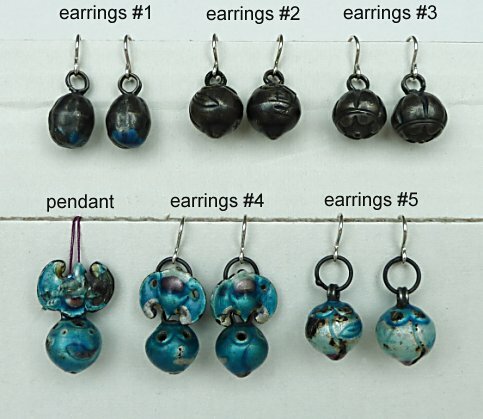 One of the blackish beads is a tubular stone but the others are from a softer material like resin. The small grey beads between look like aluminum. This is gorgeous when worn and measures 18 1/2 inches around. It is a treasure. $385.US. CH2008. 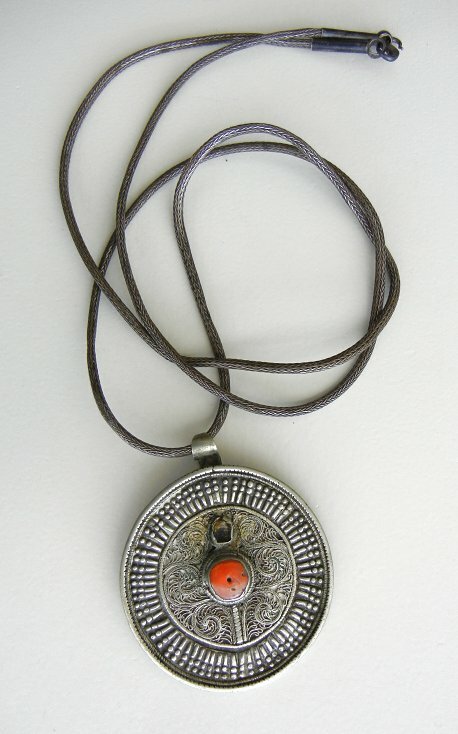 This antique silver pendant is from Tibet and strung onto a woven silver cord that is 34 inches around - very long! The pendant itself is 2 inches in diameter. There is a coral bead placed in the middle and something missing from the bezel above. This is absolutely ready to wear (thought it might need a light polish)... $185.US. CH2011. 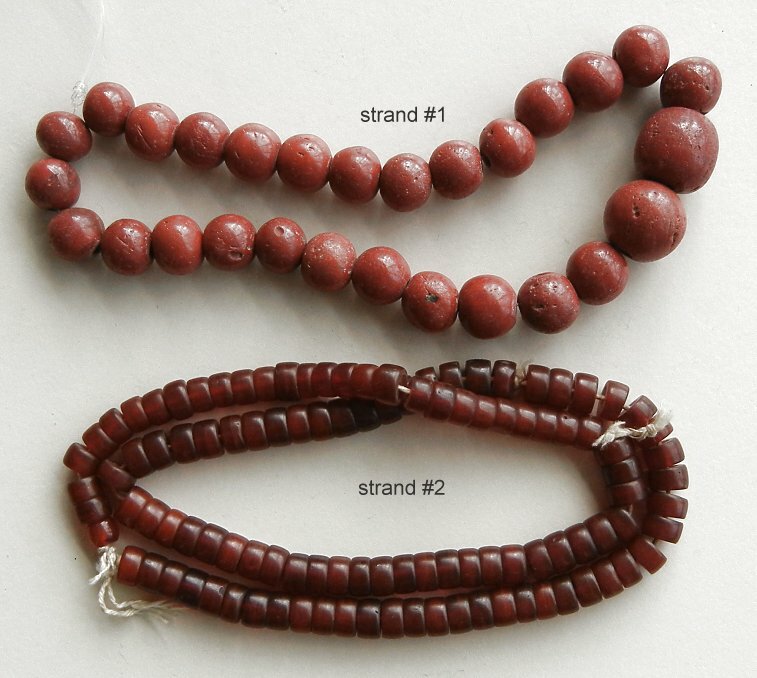 These two groups of beads were bought in Indonesia. Necklace #1 has 11 strands of tiny trade beads on it, the shortest one being 12 inches long and the longest 21 inches long. The necklace closes with a cord having a knot at one end and a loop at the other. You need a 14 inch neck or smaller for this to fit. $45.US. Necklace #2 is made of Pacific trade beads of a nice variety of colours with four coins attached. The coins are marked with "Netherlands" and "India" from around 1910 to 1921 during the time of the Dutch Empire in Indonesia. The beads are on 15 inches of the necklace strung in 3 strands. The entire necklace is 22 inches around so you would need to make sure that you can slip it over your head. $95.US. CH2019. Here is a magnificent necklace from the Chin people of Burma. 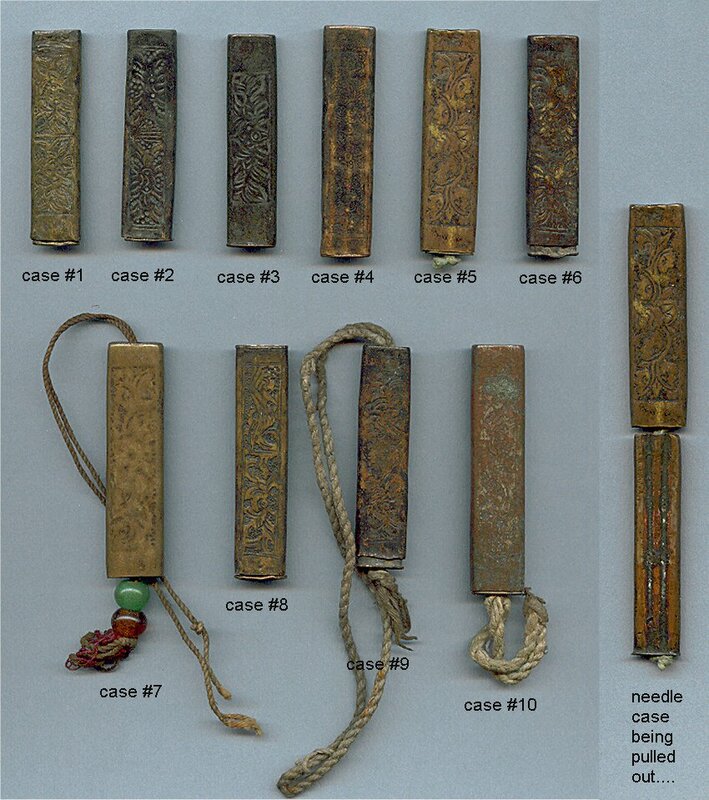 You can see some interesting collections in the book "Beads of Borneo". 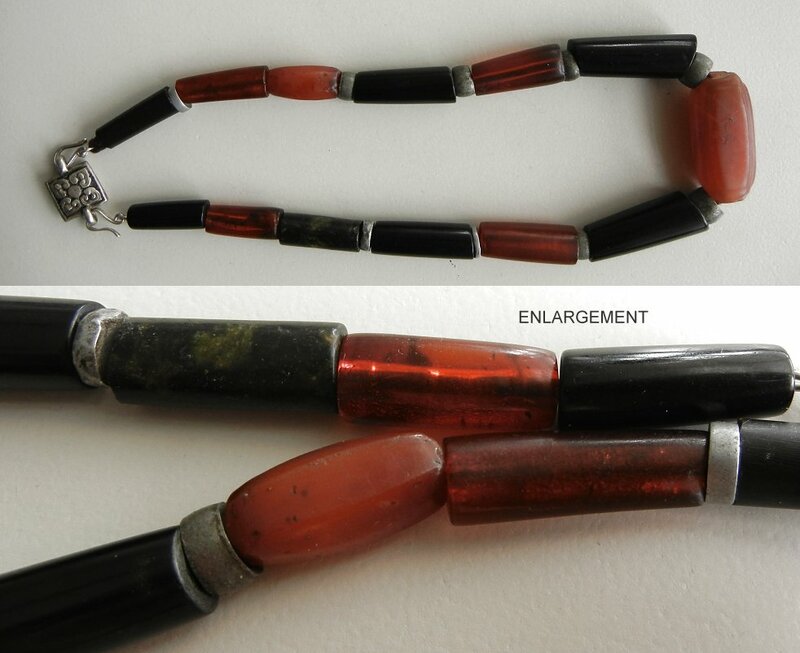 This antique necklace goes 37 inches around. It is made from red whiteheart beads, Pacific trade beads, vaseline beads and various Chinese beads. A treasure on this necklace is a single marble bead 3/4 inch in diameter. The necklace can be draped around the neck and worn like is but I would be gentle with the old stringing that it has. $550.US. CH2023. 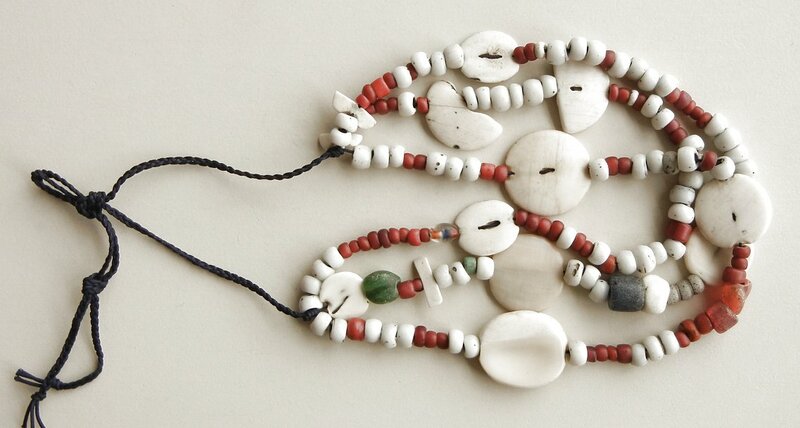 This necklace is from the Naga area and is very typical. 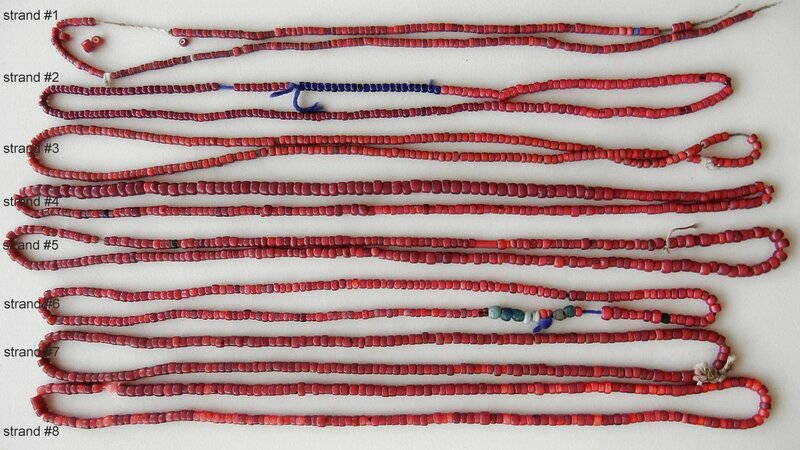 It is made up of 2 groups of red whiteheart trade beads of 34 strands each - 64 strands in total. The strands are created so that every two strands meet into a single strand at the ends, and those single strands (16 in each group) are tyed together and bound with black fabric. The necklace is 23 inches around and closed with a loop and button. Because of the 64 strands of beads the necklace is quite heavy. $450.US. CH2024. This is a very attractive antique Naga necklace with a 2 1/4 inch in diameter shell piece at the back. The necklace is made of five strands of 25 inches of red whiteheart beads topped with 3/4 inch of dark blue beads. 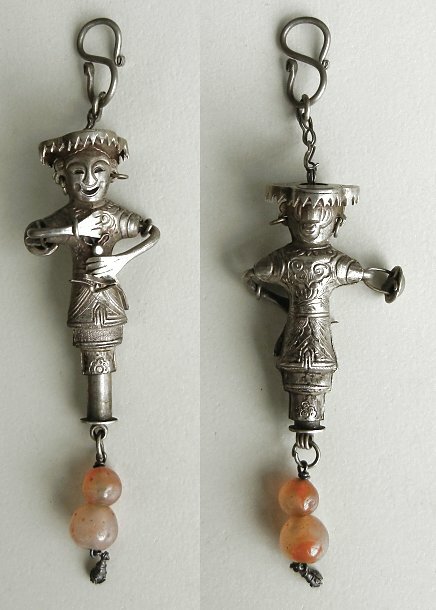 They are brought together with a Chinese version of a padre bead, and then 4 inches on each side of "Sherpa coral" - glass beads made to imitate coral. $450.US. CH2034. 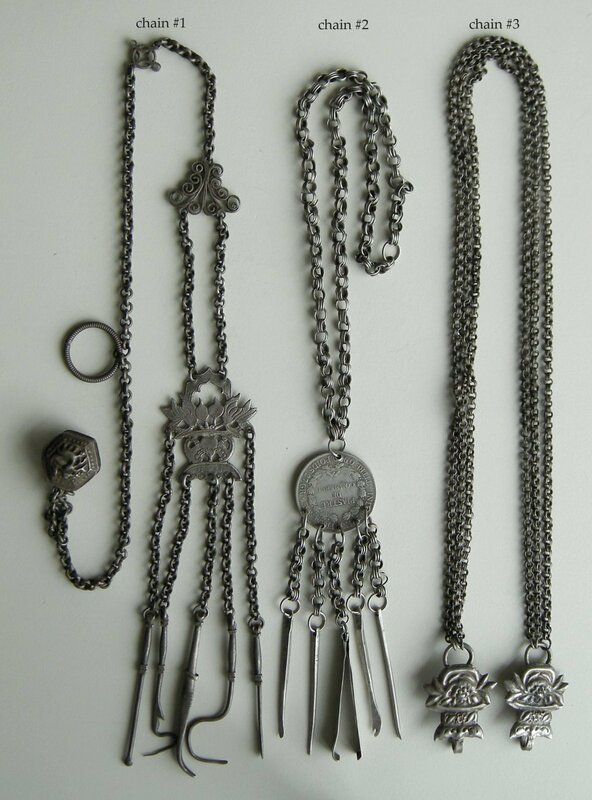 I love the fish necklaces, this antique silver one from Laos carries a grooming kit/tool kit. One of the tools is missing and I have not been able to find a matching one. I do have silver pieces for sale at CH2036 below or something different could be added like a carnelian bead or something to bring health along with it. The fish is a symbol of abundance and success. The piece is 19 1/2 inches long from one end to the other. The chain part goes 20 inches around and the fish is 2 1/2 inches from one end to the other. This is from the collection of James Lankton the bead researcher and creator of the Bead Timeline book and poster. $425.US. CH2037. 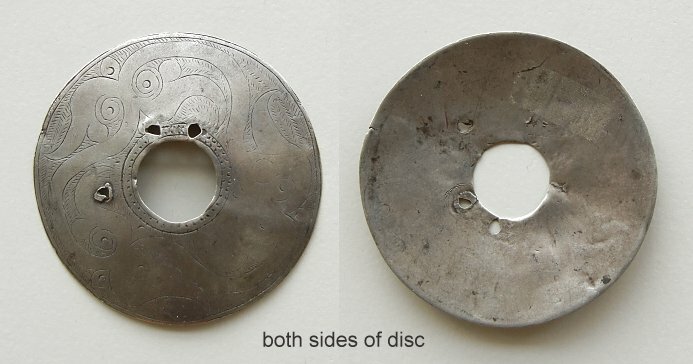 This silver disc was etched with delicate patterns all over the front. It has been worn down over a long time so that the graceful lines are a little faded. 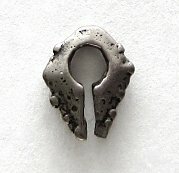 I think it once closed with a silver button but instead holes were pierced into it for attachment. The disc is 2 3/4 inch across and the hole has a diameter of 3/4 inches. It is an interesting piece to use. $55.US. CH2038. This antique silver container needs a little cleaning up. 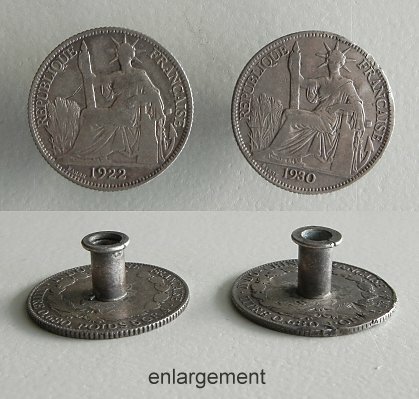 The maker has used coins (1922 and 1937 - 25 cents) as the bottom and as the lid. The coins say "Republique Francaise" on them and the box was bought in Thailand. The lid slips off easily. It was probably used for something like tobacco. 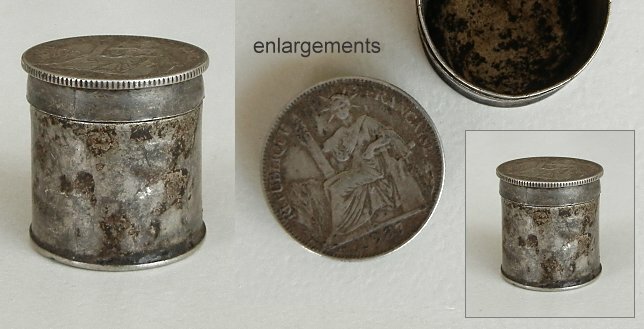 The container is 1 1/16 inches tall and the coin is 1 inch across. $110.US. CH2040. 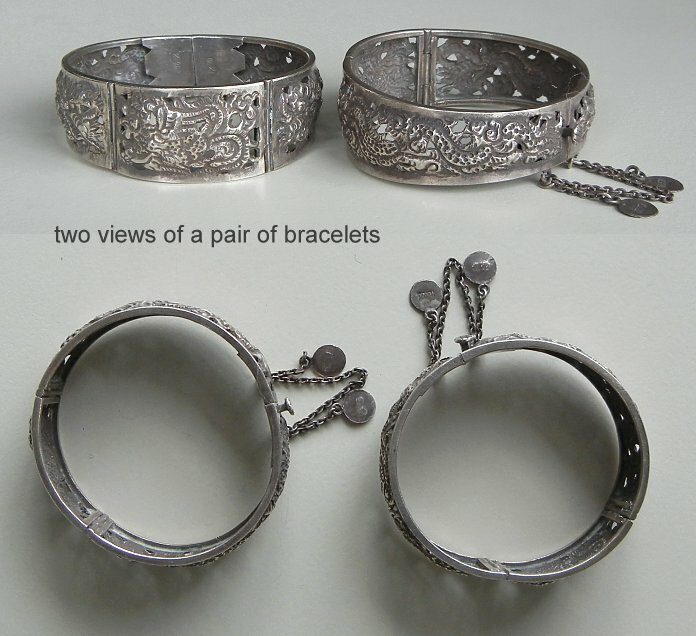 You can see this style of antique silver bracelet from the area of the Golden Triangle on page 268 of "A World of Bracelets". The author says: "Hollow bracelets, whether twisted, grooved, smooth or bulging, are made by the Shan, but are often worn by other peoples, such as the Lahu and the Akha of the border region between Burma and Thailand." This bracelet has a dent in one side as you can see in the photo. The rest of the bracelet is undamaged. The bracelet is 3 1/2 inches across. The inside of the bracelet is 2 1/8 inches by 1 3/4 inches with a 1 1/5 inch wide opening. It stands 1 1/8 inches tall. $225.US. CH2041. 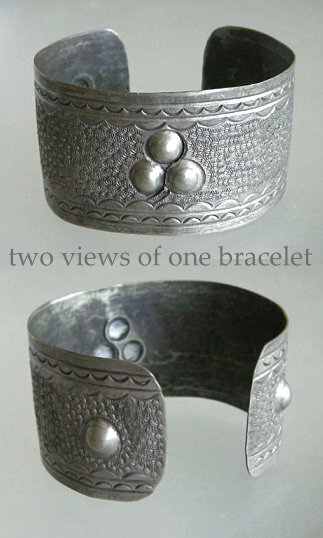 You can see this style of antique silver bracelet from the area of the Golden Triangle on page 268 of "A World of Bracelets". The author says: "Hollow bracelets, whether twisted, grooved, smooth or bulging, are made by the Shan, but are often worn by other peoples, such as the Lahu and the Akha of the border region between Burma and Thailand." This bracelet has not been worn for a long time so has a layer of tarnish on it - a job for the new owner. The wides part of the bracelet is 3 3/4 inches. The inside is 2 1/4 inches by 1 3/4 inches with a 1 inch wide opening. The bracelet stands 1 inch tall. $245.US. CH2042. 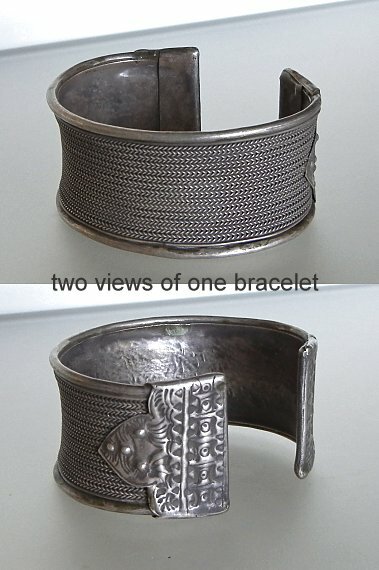 You can see this style of antique silver bracelet from the area of the Golden Triangle on page 268 of "A World of Bracelets". 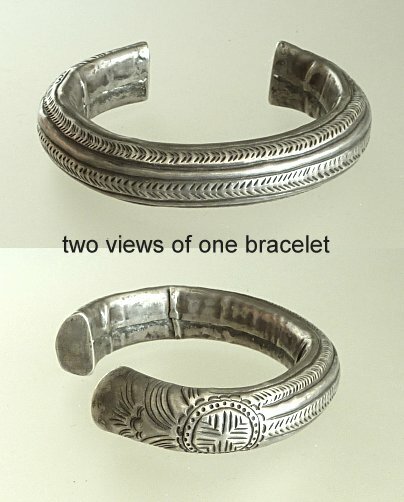 The author says: "Hollow bracelets, whether twisted, grooved, smooth or bulging, are made by the Shan, but are often worn by other peoples, such as the Lahu and the Akha of the border region between Burma and Thailand." The widest part of this bracelet is 3 1/2 inches across. The inside is 2 inches by 1 5/8 inches with a 1 inch wide opening. $275.US. CH2045. Here is a lovely necklace put together with a variety of components. 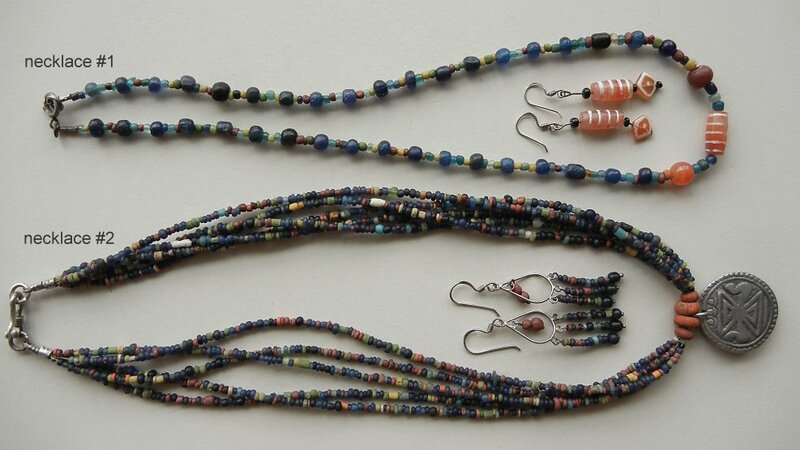 The triple strand of blue beads are lapis lazuli from Afghanistan. The carnelians are from China as well as the pear shaped carving (I am not sure of the material - it is resin-like). There are two antique silver beads on the strand as well. The entire piece measures 22 inches around, and the pear shaped part of the carved pendant is slightly over 1 1/2 inches tall. Glass beads dangle below. $45.US. CH2048. 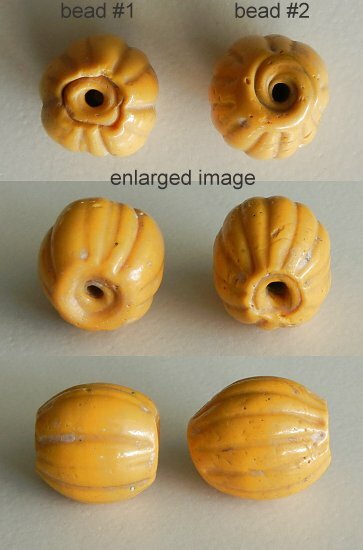 I have some groups of 11th Century Chinese made beads that were bought in Indonesia and area. In this listing, there are three short strands each in shades of ocean blue and green. 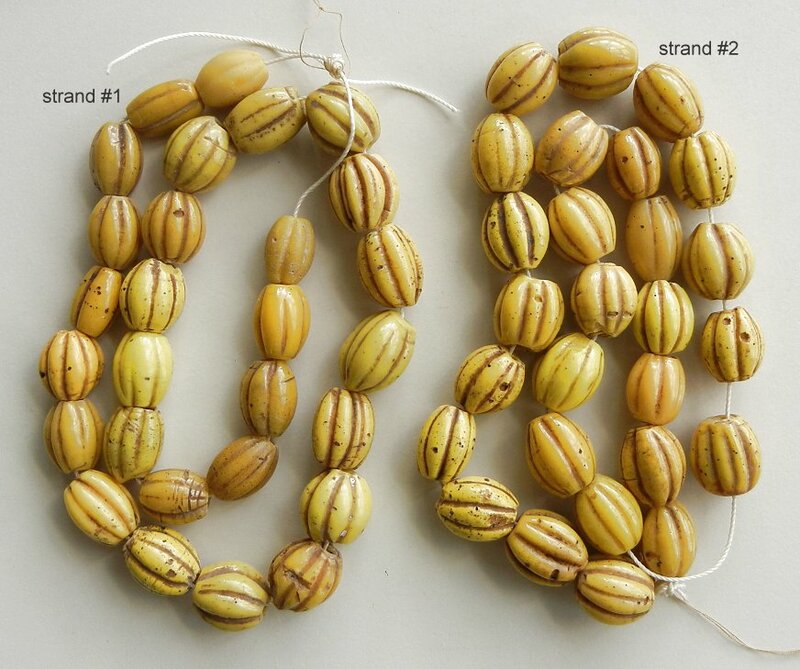 Strand #1 has been called "onion beads" in the past and is 10 1/2 inches long with beads averaging well over 1/2 inch in diameter. $220.US. Strand #2 is 5 inches long. $50.US. (on hold) Strand #3 is 8 1/2 inches long. They have a great matte surface. $135.US. CH2049. 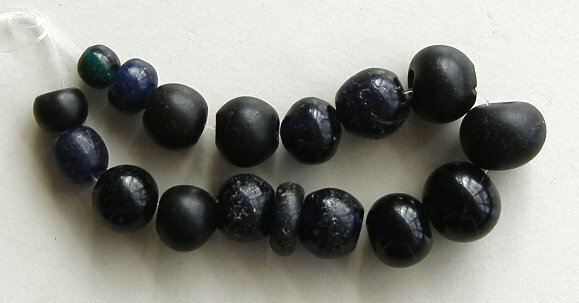 These facet bicone beads were bought in Malaysia, and were made by Indo-Pacific bead makers (probably in Java) who manufactured them centuries ago. Because of burial the beads had a matte surface to them but they were polished to bring out the colours and the glow of the glass. There is still some remains of the buried surface on some of the beads, just as a reminder of their history. The strand is 34 inches long. $325.US. CH2058. 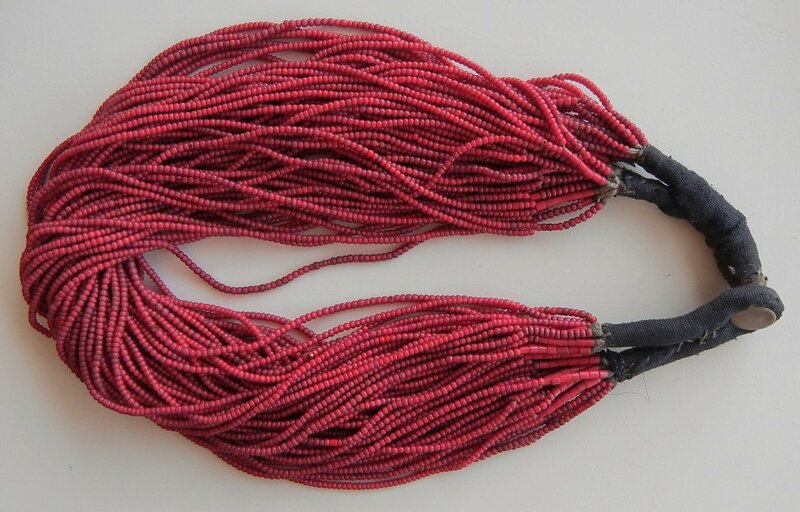 The cord on this strand of vintage red glass beads is broken, so they need to be restrung. $55.US. CH2059. 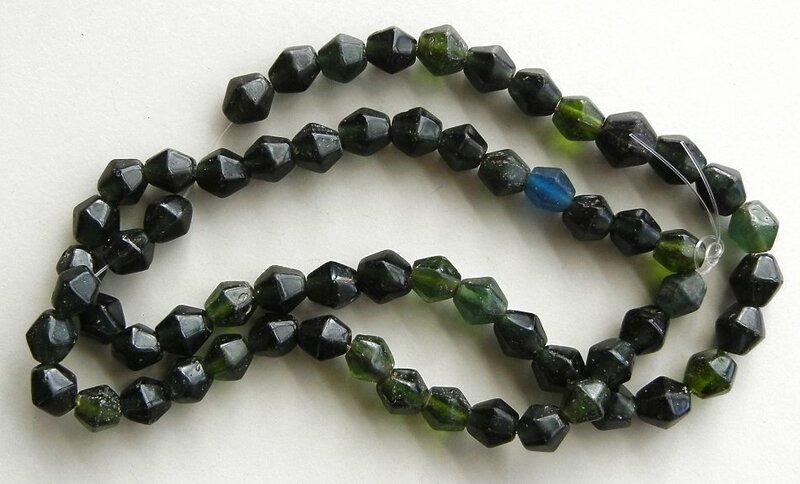 Here is a very attractive antique strand of glass beads. There are 21 inches of beads on the strand. $65.US. CH2060. Here is a vintage enamelled container from China, shaped like a heart. The lid screws off. The chain is 20 inches long, and the pendant is 1 3/4 inches tall. $105.US. CH2061. 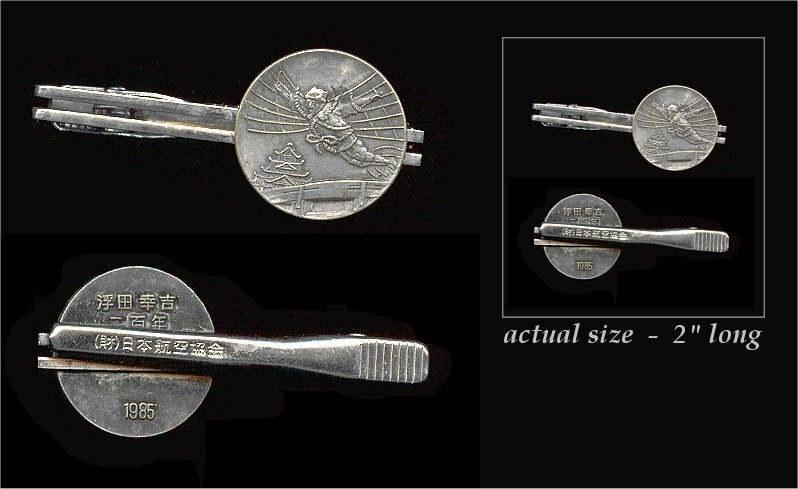 The silver coin used to suspend the tool kit is from Indonesia and says "Republique Francaise" on one side. The chain is 26 inches around and the coin plus tools measures just under 4 1/2 inches long. The pieces are antique and nicely worn. This is a great necklace as it is. $295.US. CH2063. This Japanese coin has been set into a sterling silver ring. It is a size 7. $104.US. CH2064. 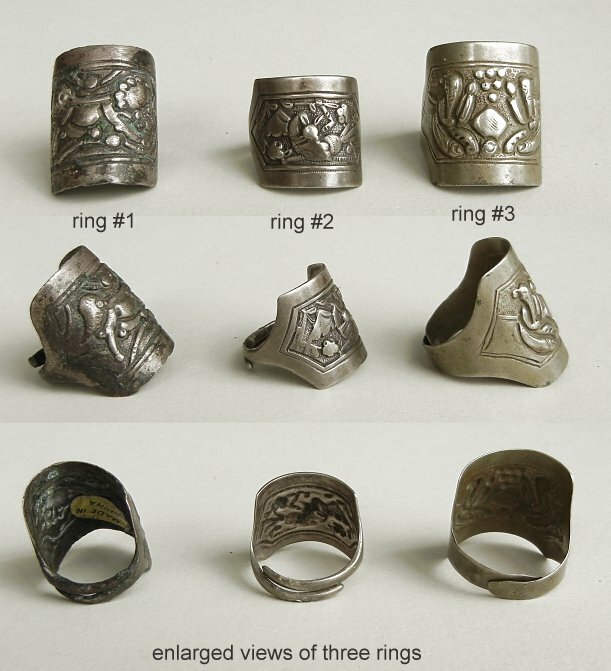 This group of antique opera rings from China is sold together for $75.US. CH2065. 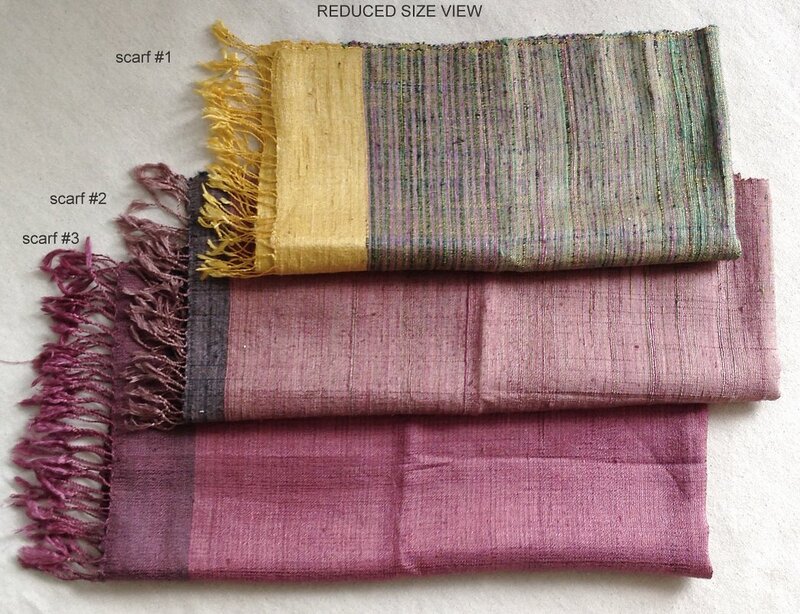 I have three raw silk hand dyed shawls/scarves from Thailand illustrated here. Shawl #1 is 57 inches long (plus fringes) and 13 inches wide $50.US. Shawl #2 is 70 inches long (plus fringes) and 13 1/2 inches wide $55.US. Shawl #3 is 70 inches long (plus fringes) and 18 1/2 inches wide $70.US. CH626. This delicate antique good silver Chinese tool kit is 14 inches tall. Each part of this is carefully and gracefully made. There are two tools hanging from it - once there were three. There is one hoop left to hold something else in the middle but it is not strong so if you are to hang something there it should be quite light weight. This is 19th century and very attractive. $240.US. CH654. 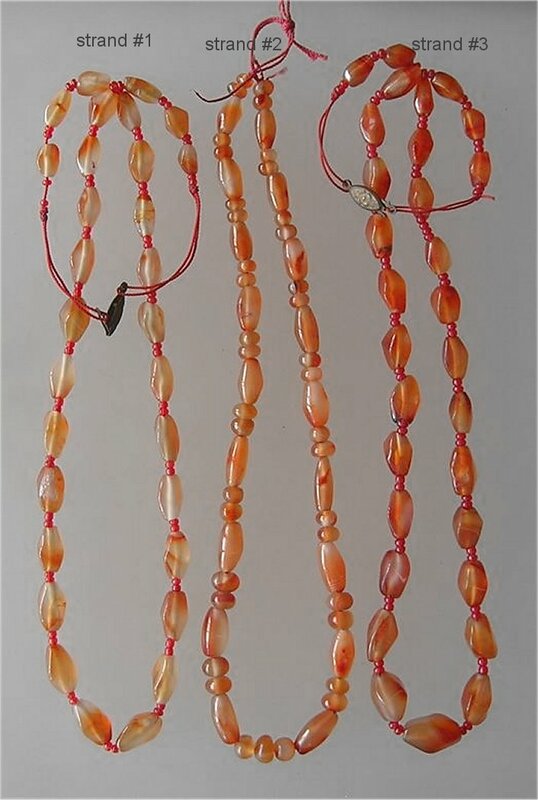 There are more than 40 inches of beads on this strand, consisting of carnelian, glass and silver. 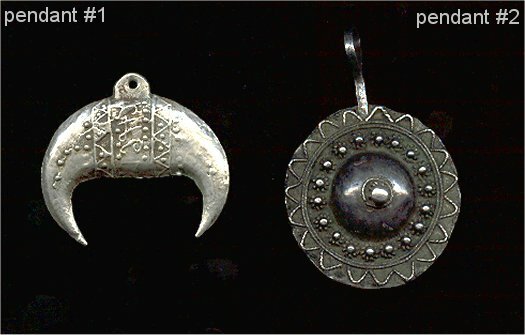 I love the two spotted beads and the pendant which is a piece of horn. I don't know of what animal, just that it has a great colour and texture and must have been found in the forests after the animal shed it. $355.US. CH662. 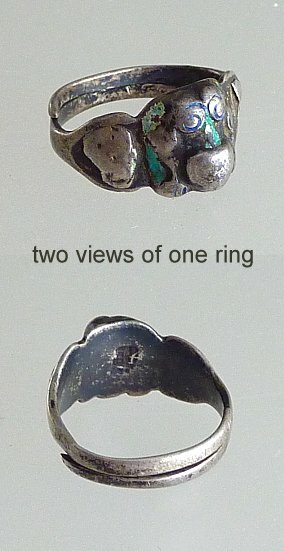 I have three silver antique Chinese rings illustrated here (slightly enlarged in size) - the first two are hallmarked. The second and third are foolishly upside-down. The rings are made to be adjustible as many Chinese rings are - but because these are old the silver will not bend easily so it is best not to try to adjust them but accept the sizes as they are. Ring #1 with the floral/star pattern is a size 8 - $40.US. Ring #2 has a butterfly pattern on it and is a size 9 - $40.US. Ring #3 has a plump fish on it. Size 9 - $40.US. CH667. 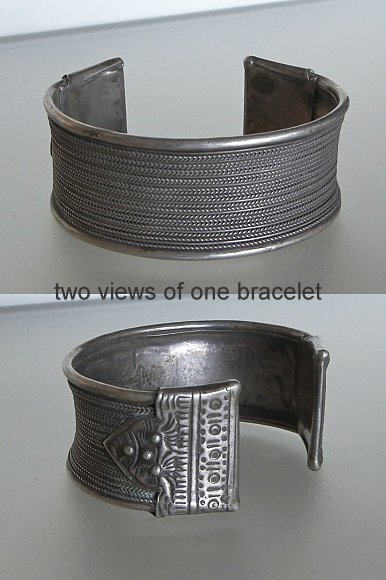 This is an antique low end silver bracelet bought in South East Asia. It is 1 5/16 inches tall and can be easily (carefully) shaped to fit to the wrist. This is for an average wrist size - not a small one. $45.US. CH671. This three dimensional silver fish is a real charmer bought in southern Laos and most likely from the Yao people. It is nicely decorated but the patterns have been softened by wear and have caused it to imply the blur of a living creature swimming under water. The fish is just under 2 3/4 inches across. The fish is attached to a double chain which is fastened on each side to jump rings just under 7/8 inch across. The chains measure 9 3/4 inches on each side adding up to 19 1/2 inches total. If you would like to fasten the rings together as in a necklace ask me to include a silver jump ring to make that connection. A grooming kit hangs from the fish. Over the years three jump rings above the fish have been worn though and have been replaced with string. It wouldn't be difficult to change the string back to silver rings. This would make a very charming necklace. $425.US. CH677. Spirit lock #1 is the only one available (all others are sold). The lock is 3 3/4 inches across at the widest. It still has old rings on it for hanging from so it would be easy to slip on a chain and shut the spring rings shut. The design on this piece is delicate with complex and tiny patterns. $445.US. CH703. 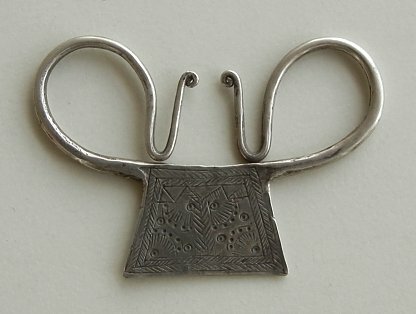 This grooming set is set up to wind around the waist (it would need a clasp though as a round hoop keeps it shut) but can easily be used as a necklace as it can slip over one's head. The suspension chain is 26 inches long. 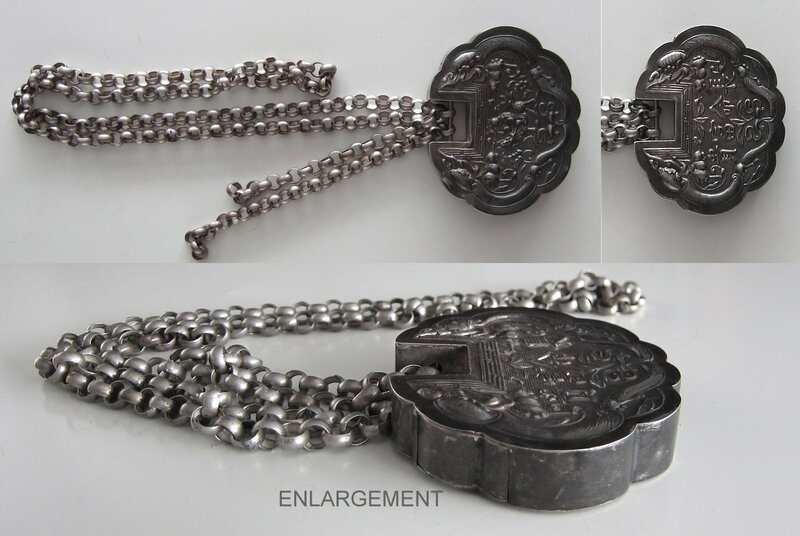 The coin pendant is 1 5/8 inch across and from Indochine Francaise/Republique Francaise 1888. 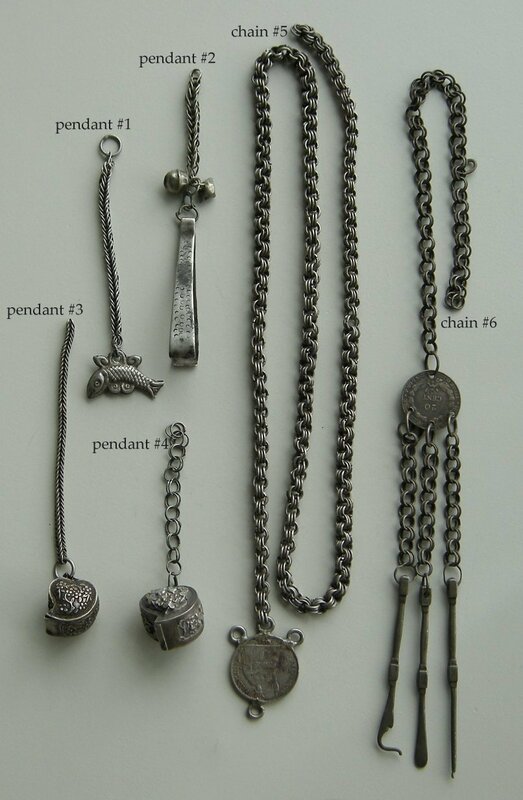 The coin, chains and tools are 6 inches in length. The piece has darkened nicely but can be rubbed a little to bring up the gleam. This is very attractive. $365.US. CH705. This is a great dangle coming from Laos. It jingles quite a lot if you move it at all as there are so many different parts. The entire piece is 7 1/2 inches long and it has a very sturdy solid hook for hanging. By adding a silver hoop here and there it could be manipulated into being a bracelet - it just takes a little imagination to change things. $145.US. CH711. 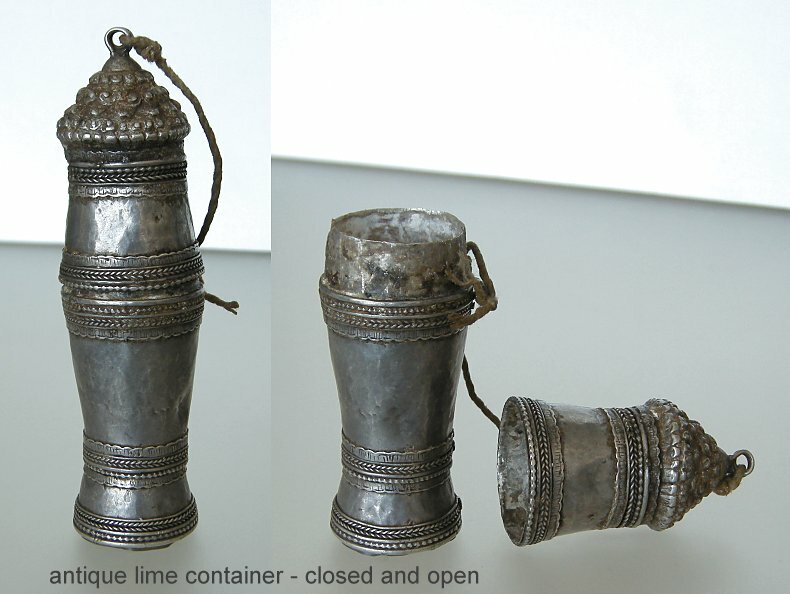 This is an antique well used silver lime container bought in northeast Laos near Xam Nua. It has a typical areca nut shaped lid and still has a coating of white lime inside. The lime is used while chewing betel leaves and areca nuts which is a tradition in Loas, Vietnam and other parts. The piece is 5 inches tall when closed and the base is 1 1/4 inches in diameter. A string ties the two parts together so that the hands are free to roll the leaf up, and perhaps wrap it around the nut. $320.US. CH714. This is a piece in transition. There is a 13 inch long chain above the fish and three 10 1/2 inch long chains below. The fish inbetween measures1 3/4 inches across from mouth to tail. This was collected in northwest Laos (Muang Sing area) from a local landowner. It would originally have been from a larger piece. It totals 25 inches in length. $320.US. CH731. Here is a simple, direct bell bracelet. It needs a very flat wrist for wearing and works easily gripped while dancing in the tradition of Timor. You can see similar pieces on pages 196/197 of "A World of Bracelets". The bracelet is 2 3/4 inches wide on the inside, and 1 1/4 inch at the tallest. The opening is just under 1 inch wide. The bell has a diameter of 1 1/4 inches. $185.US. CH741. This is an unusual antique enamelled silver ring from Northern Laos - very charming and very rare. 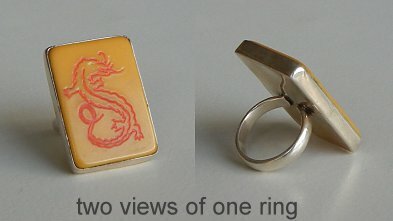 I have little documentation on these, but if you check page 160 of "a World of Rings" you will see a Mien Yao ring with similar enamelling.. I have enlarged images so that you can have a good look at the workmanship. This is the first ring that I have had that didn't just have decoration but a word on it - "HONE". The enamelling is dark yellow and dark blue with only a little remaining. The ring is a size 7.5. $185.US. CH761. This is a very attractive silver tool kit which most definitely could use some cleaning. The silver is quite tarnished. The entire piece is 16 1/2 inches long and the butterfly at the top is 2 1/8 inches across. This piece is well over 100 years old and has some excellent work on it. 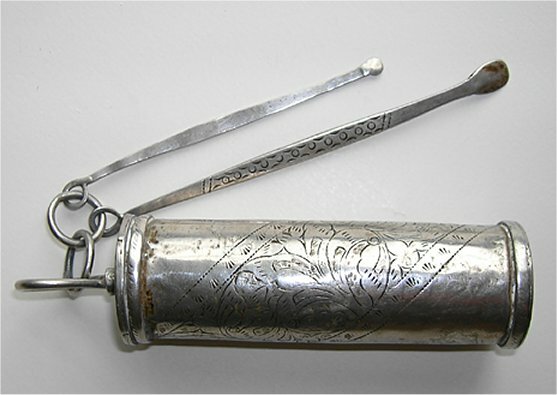 The flat tools are covered with engraving, and the tools at the bottom have a spiral wrap of silver around the handle part. 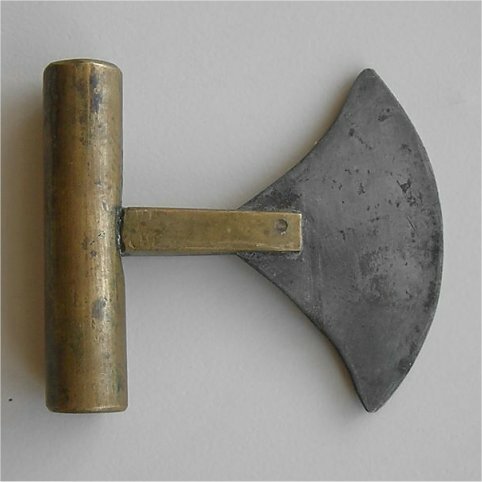 The scoop of the middle tool is covered with engraving. This is a very special piece. $285.US. CH776. The Chinese always do lovely work with silver. Bracelets like this require a lot of hammering. Annealing and hammering, many times over. The bracelet has very typical patterns on it, and small pieces of metal inside for a very light, delicate, rattling noise when moving. The inside of the bracelet is 2 1/2 by 1 7/8 inches across, made for a wrist that is not smaller than 7 inches around. The opening is 1 5/16 inches open. $165.US. CH847. Here is a gorgeous more delicate silver Chinese dragon bracelet with delicate patterning. The bracelet thickens gracefully towards the dragon heads. The bracelet is 2 1/4 by 2 1/2 inches across on the inside. The opening is 3/8 inch across but the bracelet twists a little to help to put it on. $175.US. CH849. 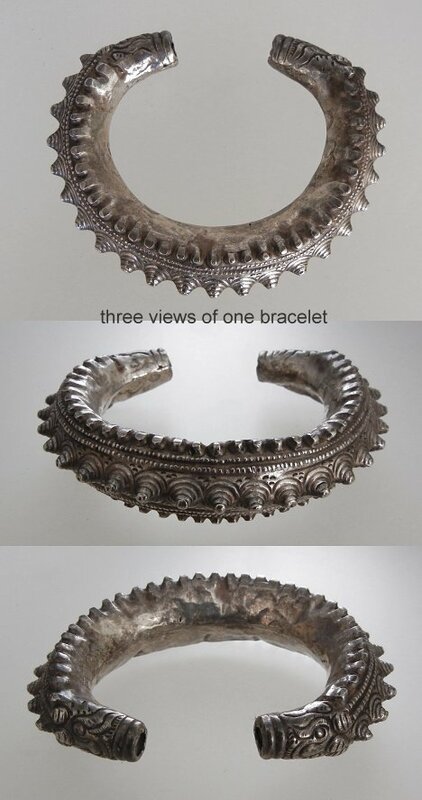 This decorated silver bracelet from China is 1 3/4 inches by 2 1/8 inches across on the inside. The opening is 1 inch across. $175.US. CH850. This is a very decorative antique Chinese bracelet. The patterns are soldered onto a frame made of circles soldered together on the inside and outer frame. 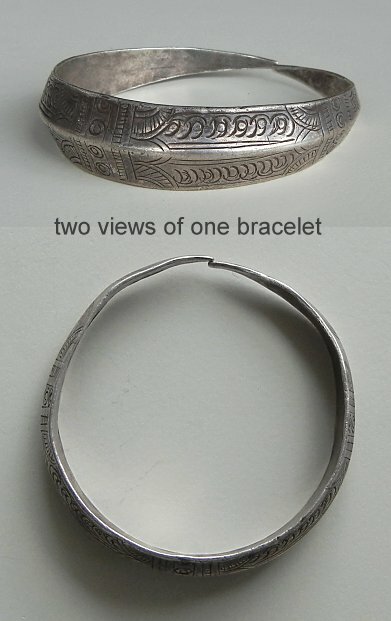 The inner part of the bracelet averages 2 3/8 inches in diameter. The bracelet is slightly over 1/2 inch tall. You need to be able to slip this over your hand. $170.US. CH854. Unmatched Meo earrings used by Hmong women from the Golden Triangle. The shapes are always fascinating. $45.US. CH856. 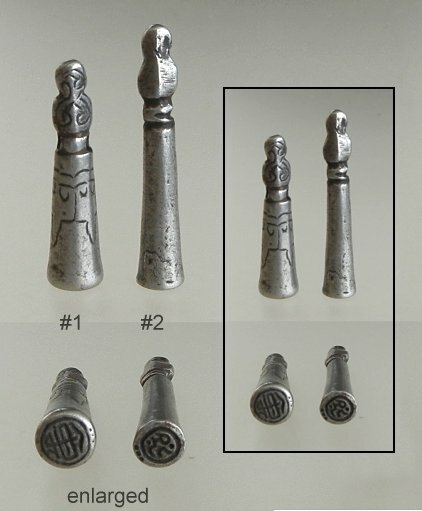 Unmatched Meo earrings used by Hmong women from the Golden Triangle. The shapes are always fascinating. $95.US. CH857. This very attractive pendant is 2 1/8 inches wide and 2 1/2 inches tall. It has been hammered with an intricate pattern with 8 piercings as well. The loops are very large. The metal is good silver but has tarnished over the years and once polished will gleam beautifully... $145.US. CH787. 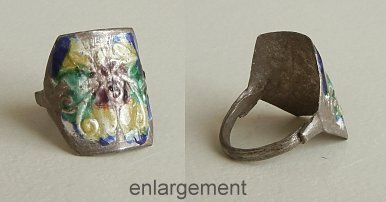 This antique Chinese silver ring has been worn for a long time so that the original enameling on it has largely been worn down. There is still a little touch of turquoise blue on it as you can see on the enlargement. As usual, this ring was originally fitted to the owner. They were made with practicality so that when bought the band could be squeezed to the correct size. Now that it is old though, the silver is hardened and you can't try to change it too much. The ring is a size 9. I am not sure of what the image on the ring represents... $35.US. CH598. This chopper was bought in Burma. It does not have a sharpened blade to it - the width of the curved piece is the same all along it, so it is not made for cutting, but perhaps for chopping. It is built in the same way that an ulu (for Inuit people) is in the north. The handle is brass and the "blade" is white metal (steel?). 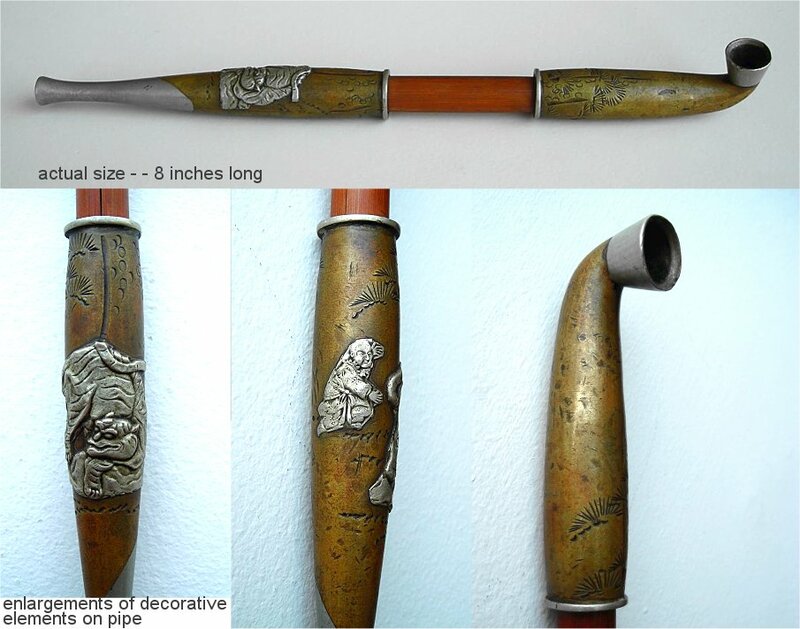 The handle is 3 1/8 inches long and 3/4 inch in diameter. The distance from the top of the handle to the bottom of the blade is 3 3/4 inches long. Less than 50 yrs old. $95.US. CH599. This is a very beautiful antique (over 100 yrs old) tool bought in China. It is made of brass and copper, and I can't tell what other metal. The tool is 6 3/4 inches long and made in the same way that a decorative knife is made. It is beautifully decorated with decorative openings through it. The smaller openings have curves of brass decorating them. The large opening is the rectangular one which is open on all four sides. There is a little ball inside (I can't tell what it is made of) which moves around when you move the tool. The working part of the tool is a curved scoop. I was told that this is for opium but I don't know if that is true. What I do know is that it is old, beautiful, and very nice to hold onto and look at. $175.US. CH455. 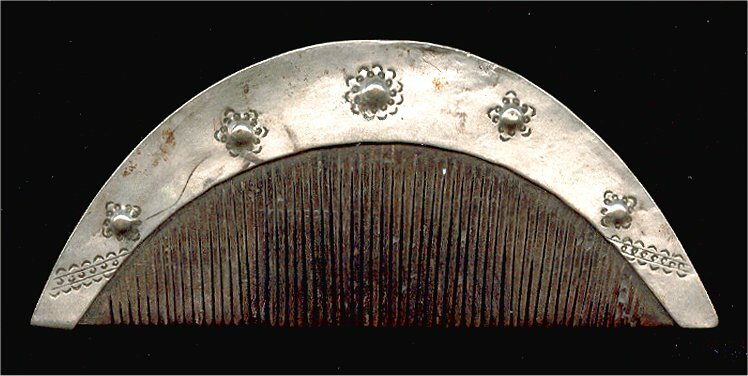 This comb came from Timor and is made of silver and wood. 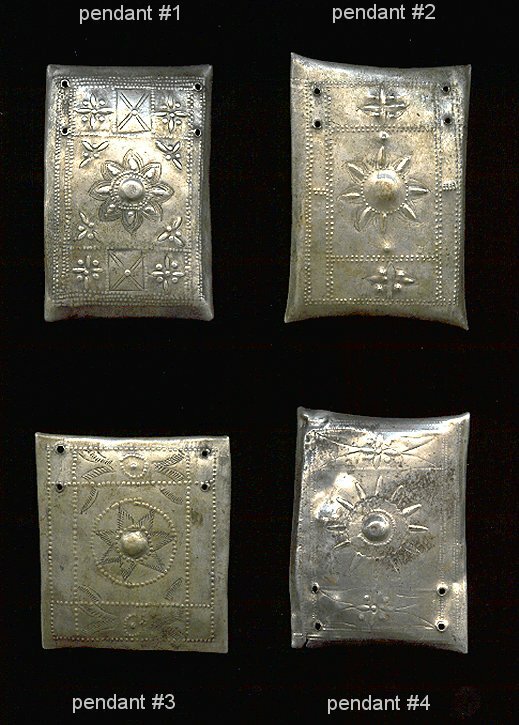 The more decorative ones were worn by wealthy Suvanese, but simpler ones like this were used by the Atoni who got much of their silverwork from Savu and Ndao. (from Power and Gold) The comb is known as a kilinoni and they are often worn in pairs, one at the front of the head and another at the crown. This is 6 1/2 inches across at the widest, and 2 3/4 inches tall. The back of the comb is the widest - almost 1/2 inch thick but the piece thins down along the straight line of the bottom. Charming. - $145.US. CH468. This is an odd combination but I have left it as it was when I bought it. 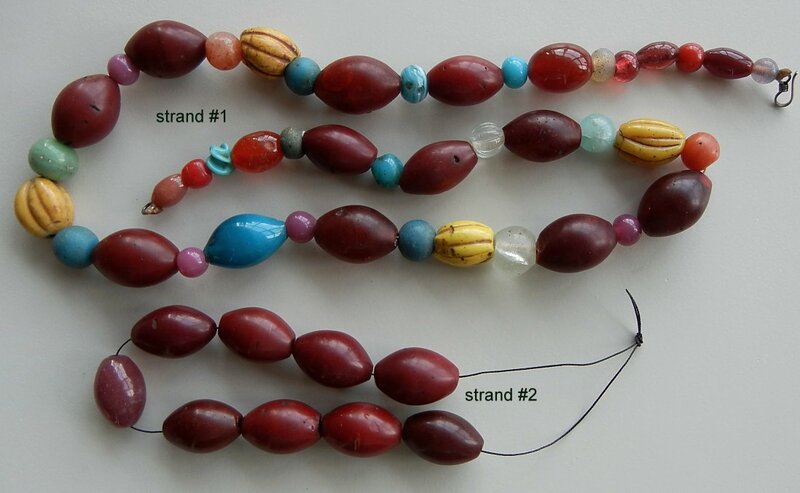 The strand of ancient beads brought out of Thailand is strung on fishing line so desperately needs re-stringing. Onto the loop below is hanging a stone "earring" which could fall off if one was just a little bit careless. According to "A World of Earrings" - "Archaeologists have found a number of stone and shell ornaments in tombs, their extreme hardness and durable character served symbolically to protect the souls of those whom they accompany on their new life. 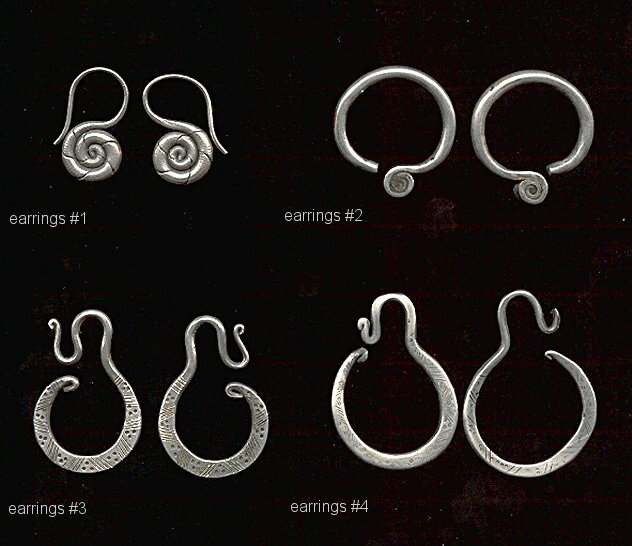 The motif of the open hoop, with a central hole, is a metaphor for the live-giving power of the woman, and was found throughout the South-east Asian mainland and islands until the twentieth century." The strand of shell, carnelians, and stone is 22 inches long, and the loop of tiny tradewinds beads hangs 2 inches below. The stone disc is 1 2/3 inches across. $275.US. CH479. This is not an antique bracelet but a vintage one. It is very attractive and portrays the traditional dragons of China. The bracelet is hollow and fairly light to wear. The inside opening is 2 1/2 inches across so it is for a larger than average wrist. The height of the sides is 1 1/4 inches at the widest, and 1 inch at the smallest at the back opening. 53grams $165.US. CH482. This is the smallest of the wound bracelets - it just has a hint of spiralling. The bracelet is just under 2 1/2 inches across and can be gently tightened by an experienced jeweller. 30grams $95.US. CH510. This is a wondrous pipe from Japan. I haven't had one before and was fascinated by this one. The 8 inch long body is made of brass and silver. The brass is hammered all over leaving interesting patterns laid into it. Hammer marks, marks that look like grass growing, and little circles making me thing of water passing by. In shaped silver is a tiger looking as if he is in a fighting mood, and behind him is a man wearing a kimono ready to challenge him. It is very beautiful. Between the two metal sections of the pipe is "wood" that looks like bamboo. The metal pieces (be careful please) can be gently pulled off the bamboo so that it can be replaced when necessary. This is a true collector's piece from an old collection of Asian items. I am sure that it can be used, or can simply sit as a thing of beauty. $575.US. ON SALE $500.US. CH517. 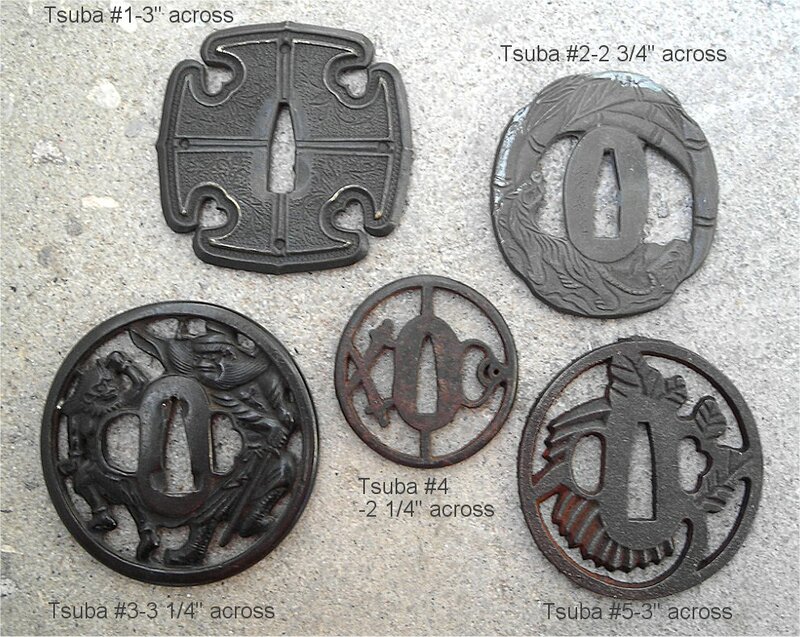 Here are some slightly rough, new Japanese Tsubas (hand guards of swords). These help to balance the weight of the swords as well as guard the bearer's hand from their opponent as well as from the sharpness of their own sword. 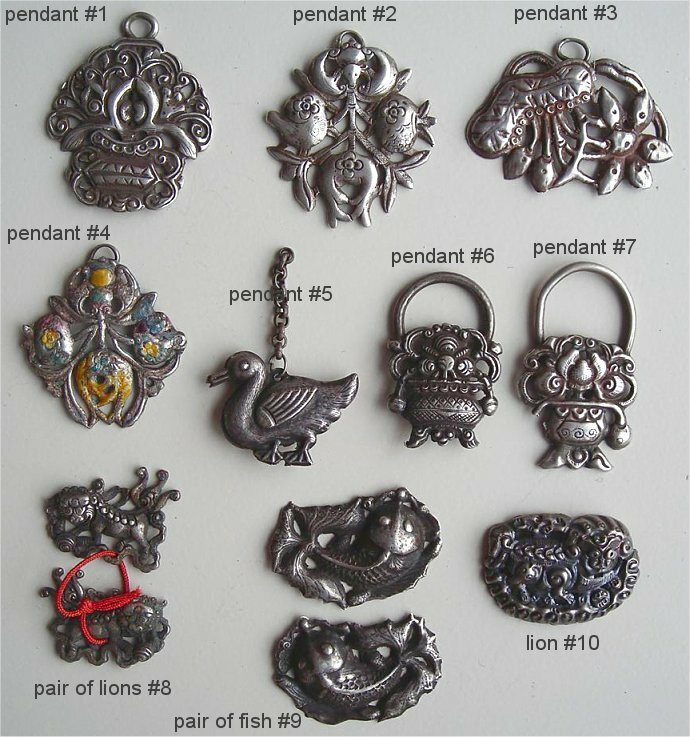 These are cast of iron in a variety of shapes and decorations. 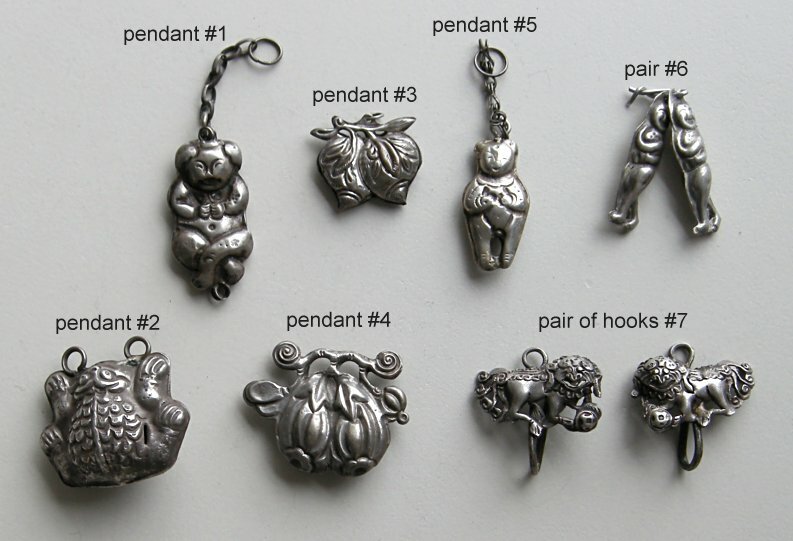 Because they are so interesting in their design, they can be used as curious (and heavy) pendants. The antique ones are very expensive as they are collected widely. The new ones don't have the smoothness and gleam of the old, but are still interesting. #3 is $55. the rest are $45.US. each. CH519. 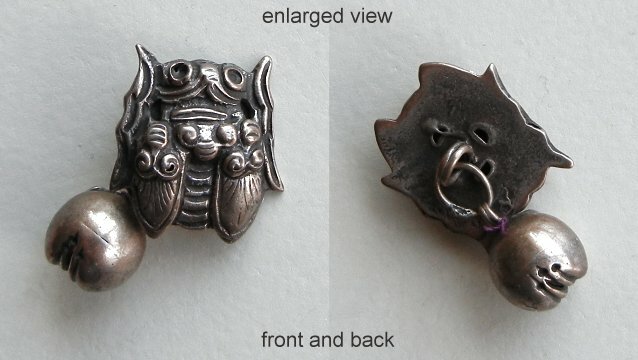 This is a Japanese tie clasp, and portrays a man with wings tied to him by ropes. He is flying over a bridge with a temple in the background. There is writing on the back and the year 1985. I was just informed of the meaning of this piece (much thanks for the information). Here is what I was told: "It says "'Ukita Kokichi' and '200 years' on the back of the medallion. The medallion depicts him gliding in front of Okayama Castle, an incident that took place in 1785. On the pin clasp it says 'Japanese Aeronautic Association' so this is a pint made by JAA to commemorate the bicentennial of the first 'flight' by a Japanese man". $28.US. CH345. 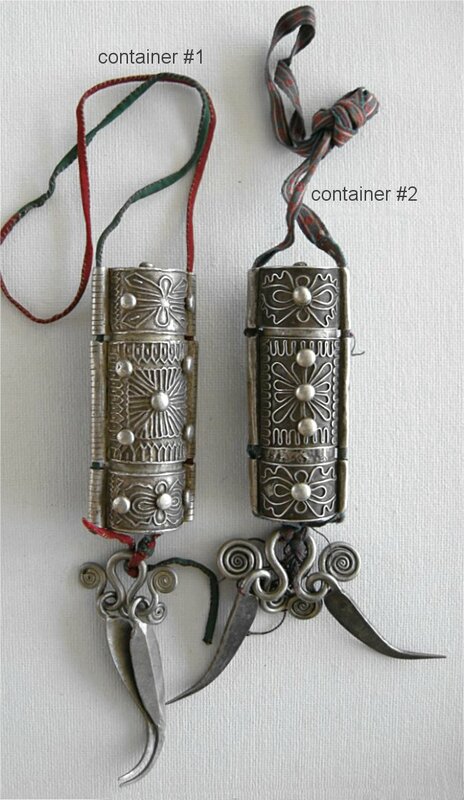 If you can't identify this silver container and tools from the Belu people of Timor, I will give you a clue. It has to do with Betel nuts. Hmmn. CH206. This is an amazing quite rare old Naga pendant strung onto Chinese "padre" beads (the string has broken so the buyer will have to re-string the piece). The Warrior's pendant is cast of brass and highly patinated to an almost black colour after many years of exposure to the air. It is 2 1/2 inches tall and 2 1/2 inches wide and quite thick and heavy. You can see the sculpting of the back on the scan. Many modern copies are made of this sort of thing, but this is old and authentic and was worn for years in the head hunting society. $325.US. EA341. These exquisite antique silver Dong or Miao earrings from Guizhou, China are finely, gracefully, kookily and intricately worked. 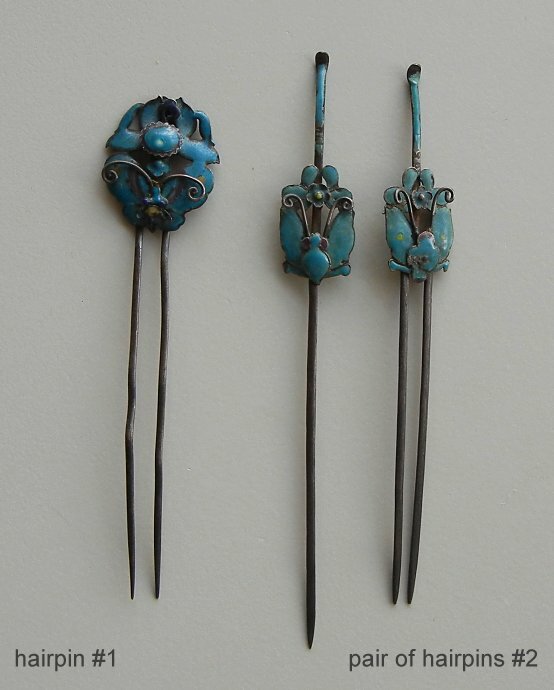 Highly collectible, you can find them illustrated on page 185 of "A World of Earrings: Africa, Asia, America". 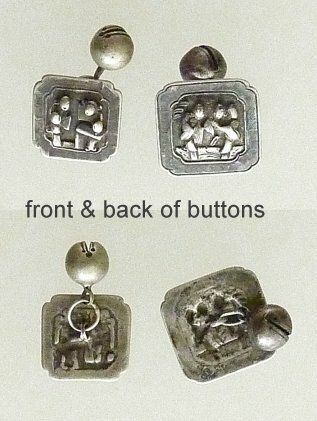 The earrings are the same size as the bottom one illustrated - about 2 1/4 by 2 1/4 inches. If you look closely you can see the impressive fine wirework that is one of the main decorative features. The large earwire has been hammered and lengthened into shape and consequently has an interesting and very attractive texture. If you have large and strong earholes, these are wearable, otherwise they would look wonderful in a display case. (44 grams) $285.US.